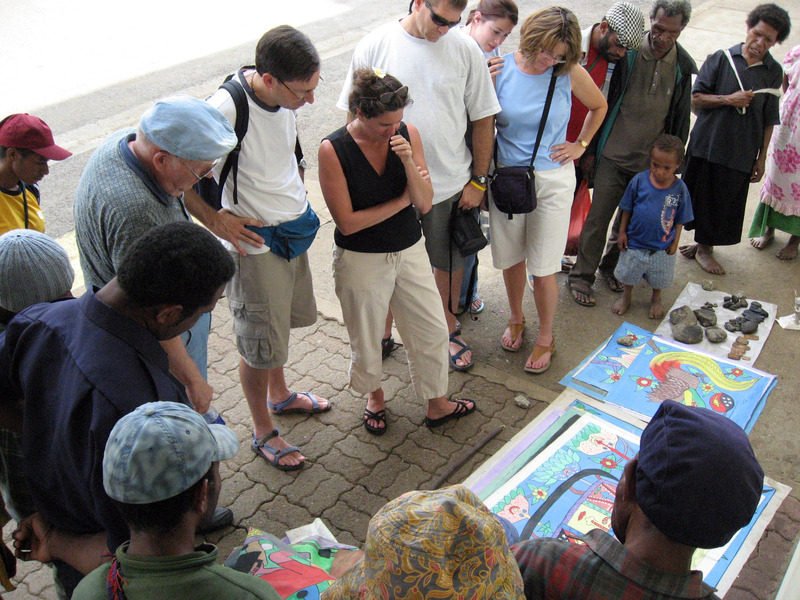 Explanation of this web page: We travelled to Goroka, Papua New Guinea and visited the Goroka Market on July 26 & 27th, 2008. This is part of a larger trip explained here. Click on any picture below for a REALLY high resolution version! We travelled from Cairns, Australia (click here for pictures relating to our days in Cairns). Here we are waiting in the Cairns Airport for our flight to Goroka. 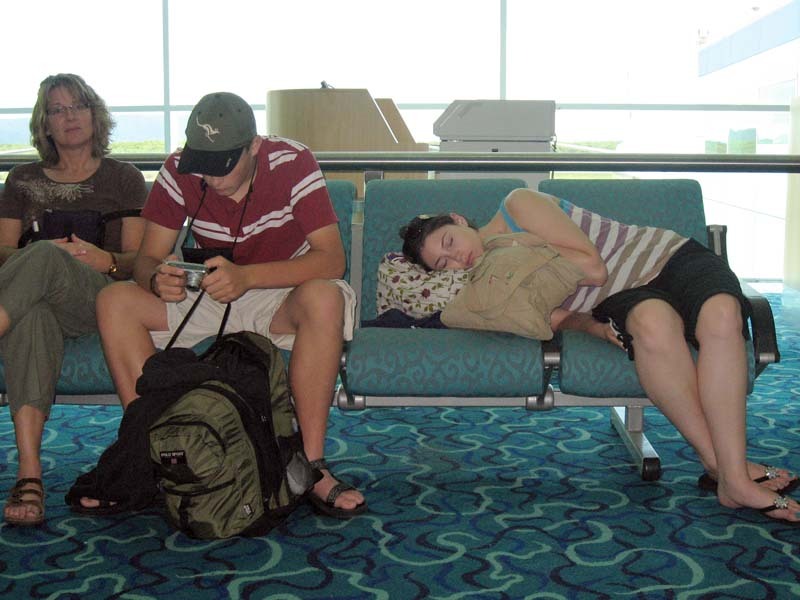 Cheryl on the left, Nathanael with the camera, and Katie crashed out on her bag. A picture of the inside of our Air Niugini flight. My Dad (Howard Wilson) is in the lower left of the picture, and that's my head sticking out in the VERY lower left. This sign in Tok Pison (Pidgin English) was on the tray table on every seat: "EM I TAMBU TRU LONG RAUSIM OL LIFE JACKETS NA OL NARAPELA SAMTING LONG DISPELA BALUS". 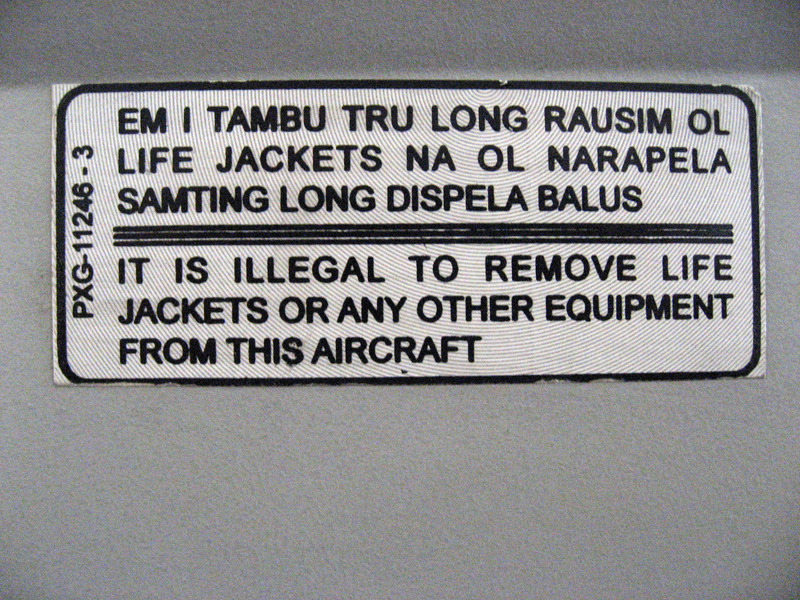 It is illegal remove the life jackets from this aircraft. 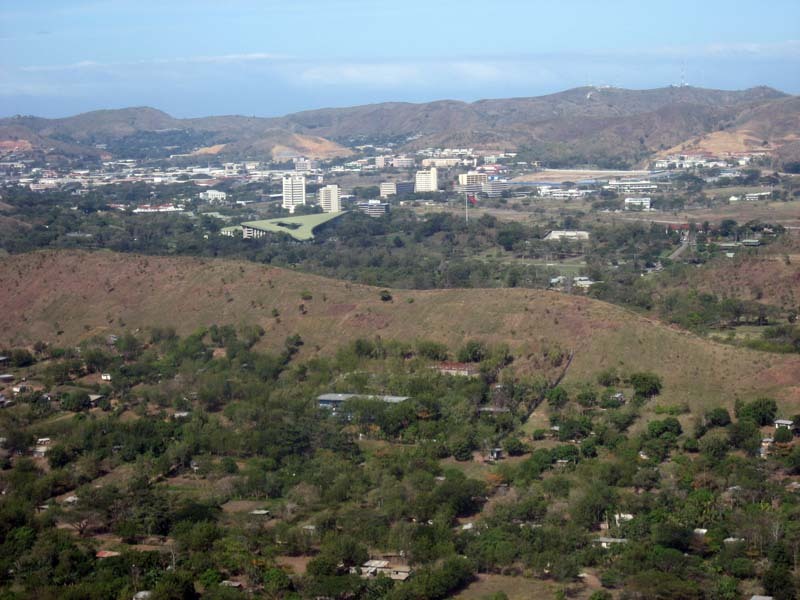 Right before we land, here is a picture of the city of Port Moresby, Papua New Guinea. You can see the high rises and big hotels in the town. Port Moresby International Airport, Papua New Guinea. None of us have been here in 35 years (since 1973). 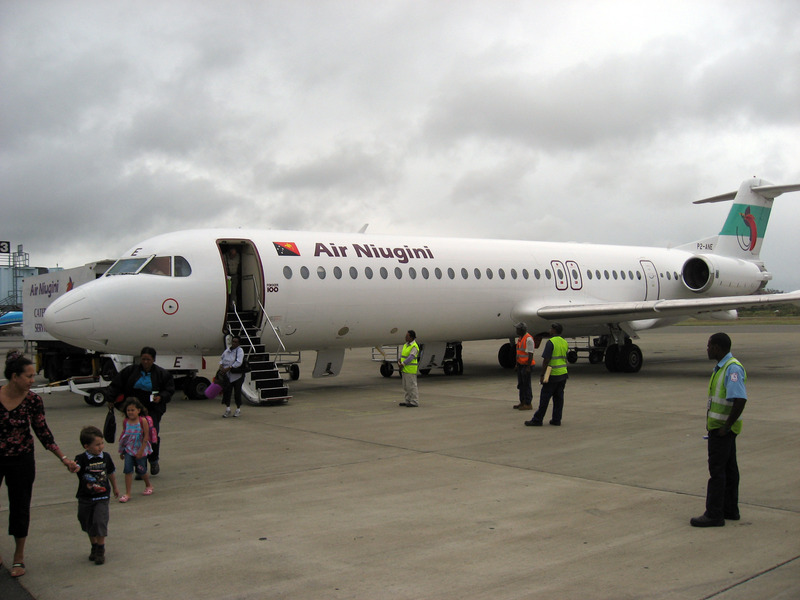 A picture of our Air Niugini flight as we walk away. 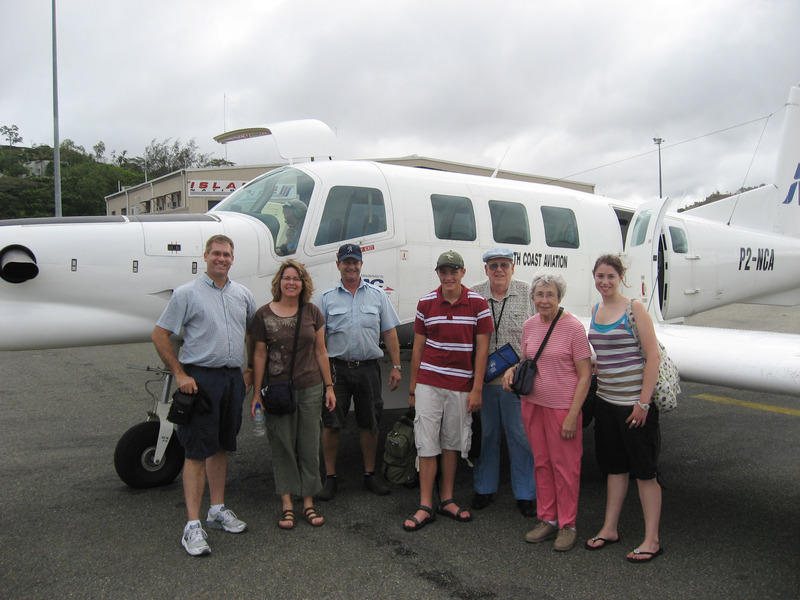 Below we are walking out to our Cessna 402C (the far aircraft). CORRECTION-> a reader says it is a PAC750XL (built by Pacific Aerospace Corporation) and looking at the web I think he is correct! Sorry for any confusion. 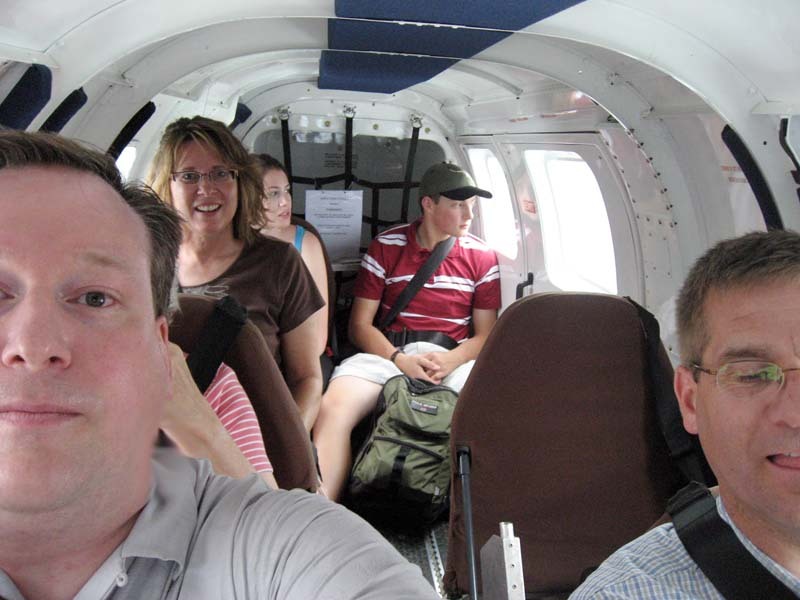 I was told on the phone we were renting a Cessna 402C. 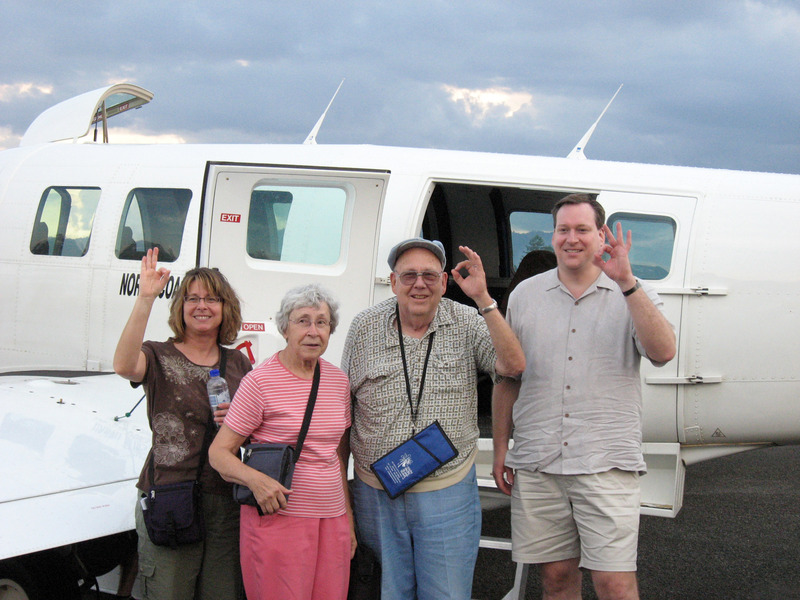 Immediately before our flight, that's Mark Hoffmann on the far left, Cheryl Hoffman (my sister), one of the pilots, Nathanael Hoffmann, Howard and Virginia Wilson, and Katie Hoffmann on the far right. 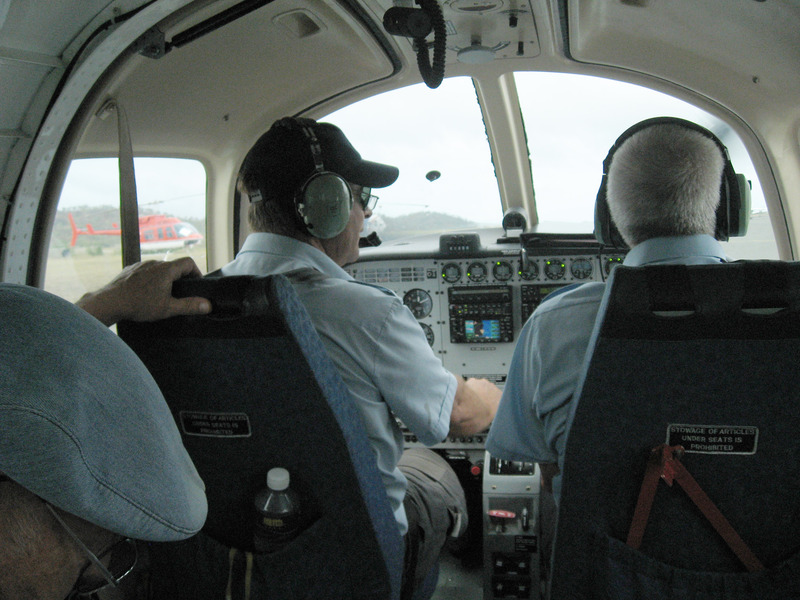 Our two pilots Rob (in the left seat, as pilot) and Geoff (in the right seat, as co-pilot). 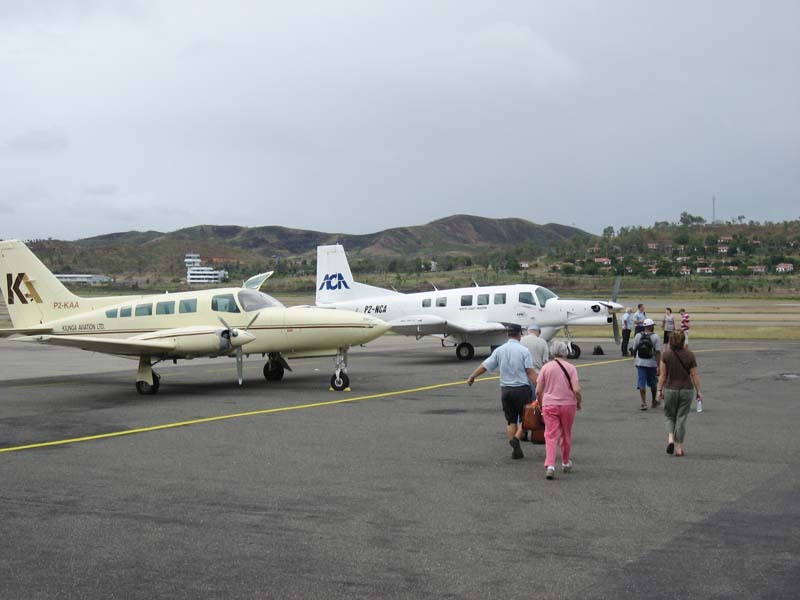 They hopped us from Port Moresby to Goroka in about 2 hours, then they continued immediately on to Lae on the northern coast of Papua New Guinea. A picture facing backwards in the Cessna 402C private charter. 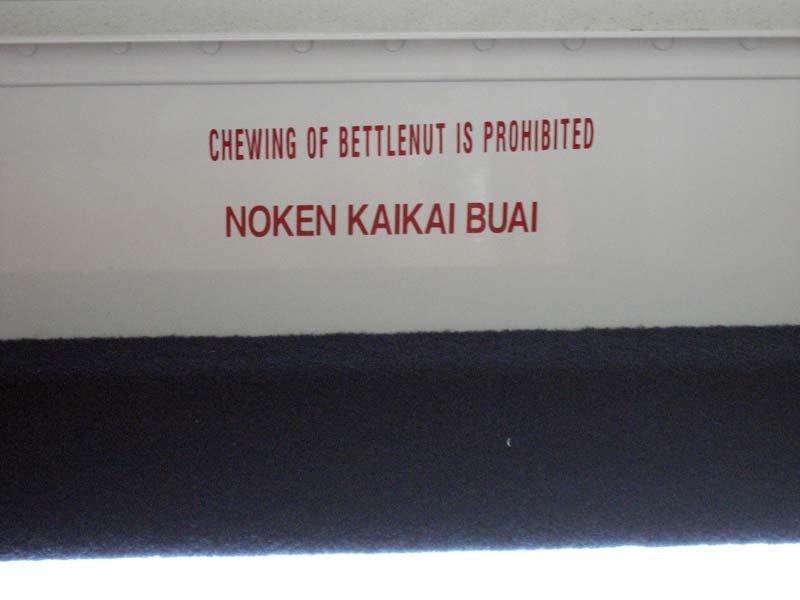 A sign in our private New Guinea charter flight: "Chewing of Bettlenut is prohibited", also in Tok Pisin "NOKEN KAIKAI BUAI". Mark Hoffmann realized there was a crack in the left wing of the aircraft, so I looked out and saw this crack on the RIGHT wing as well!! It looks dangerous to me, but the plane made it to the destination just fine. The plane might crash the next time it rains and the wing and fuselage fills with water, but it didn't rain on our flight. 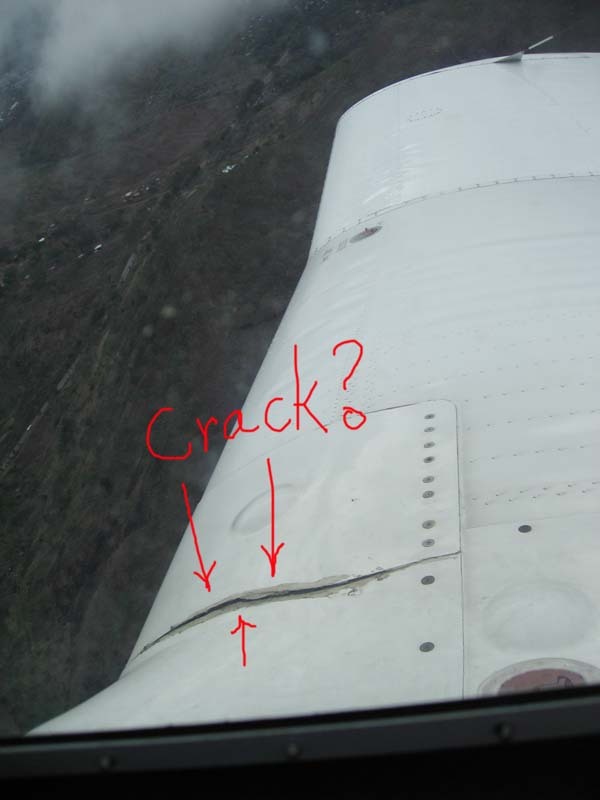 UPDATE 10/25/2010 - A reader writes, "As for the crack on the PAC's wing--it is superficial. 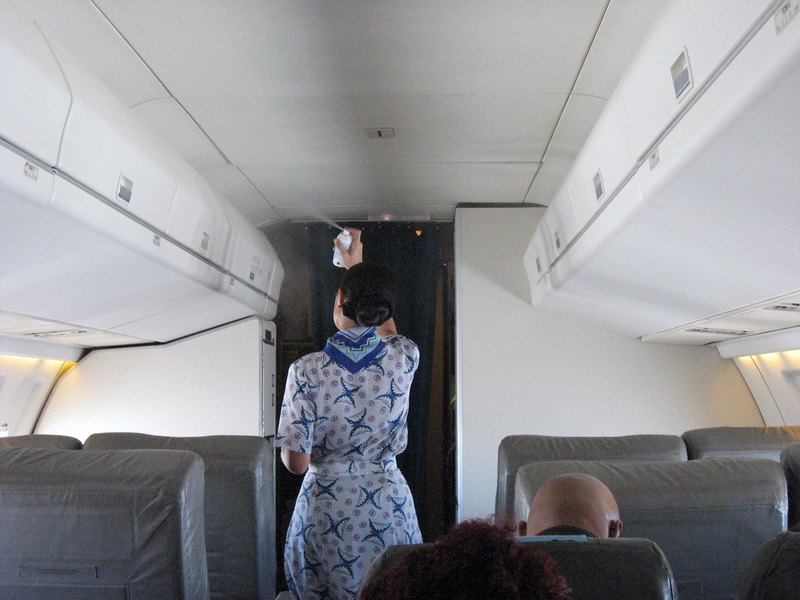 While it is un-nerving to passengers to see a crack, that is simply a cosmetic metal plate and is non-load-bearing. 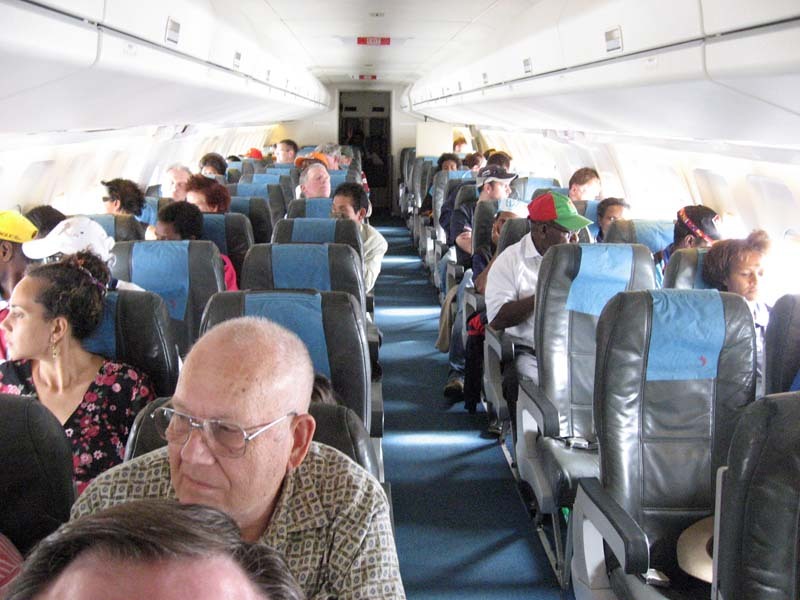 Still doesn't help passengers that have no idea what the rest of the plane looks like though! I totally understand your concern!" 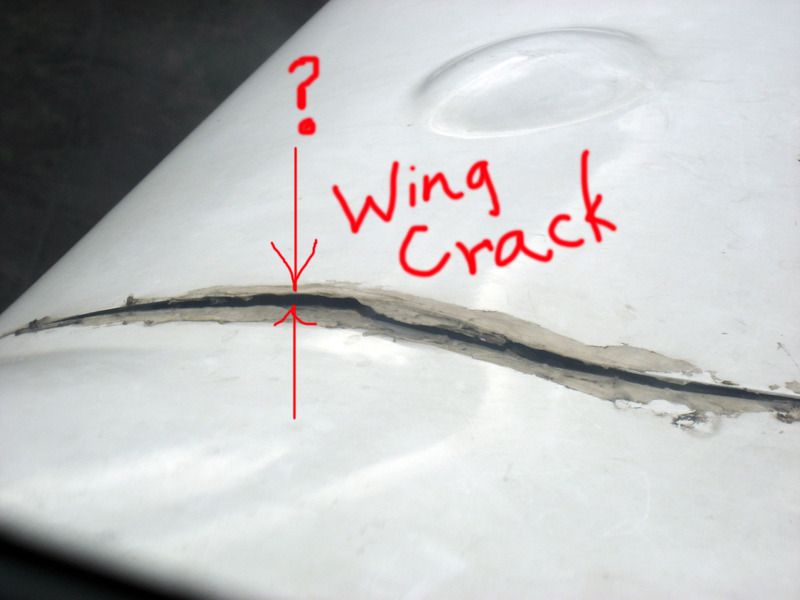 Below is a close up picture of the crack in the airplane wing. It got wider at altitude. You can also see they applied some car "bondo" to try to repair the crack or maybe keep water out, but it ripped back open (not surprising, bondo is for cosmetic repairs on cars, not for airplanes). 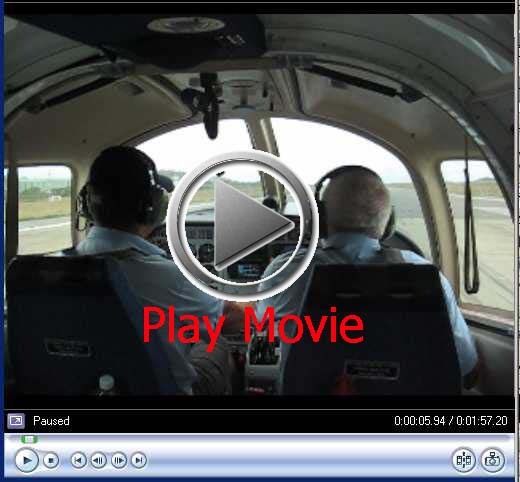 Click the "Play Movie" button below to watch a short 2 minute YouTube video of highlights of our Cessna 402C private charter ride. For WINDOWS ONLY Click Here for a MUCH HIGHER QUALITY Windows Media format movie. 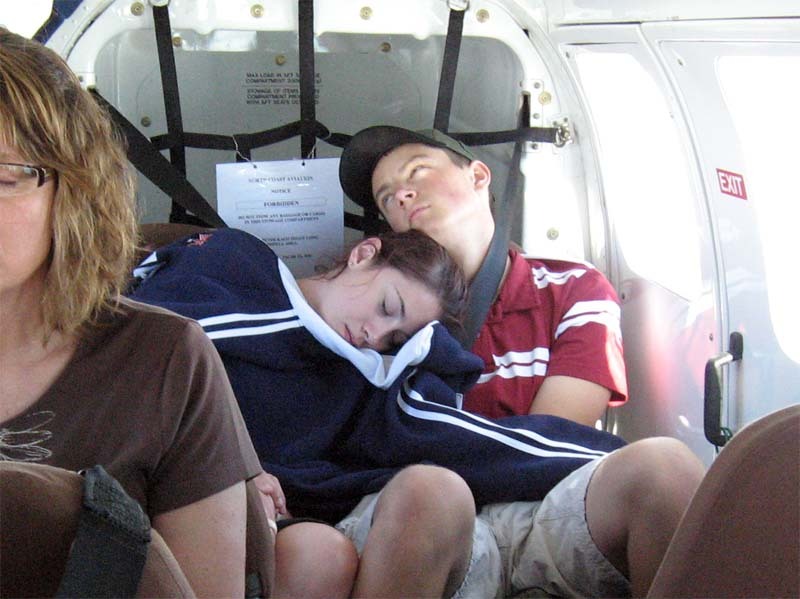 After the initial fun and interest of flying in a small plane, Nathanael and Katie got bored out and went to sleep. 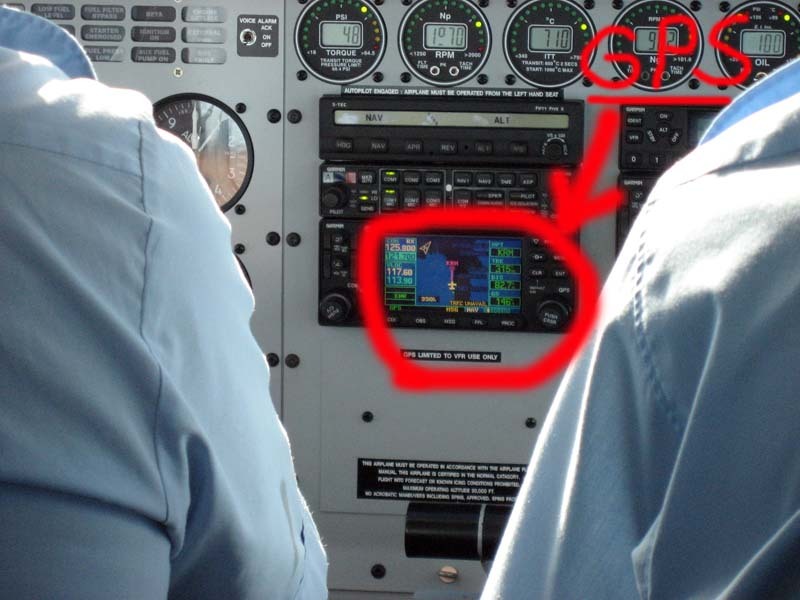 The pilots had a GPS I could watch showing we went straight north up the west cost of Papua New Guinea from Port Moresby, then at one spot cut directly towards Goroka. 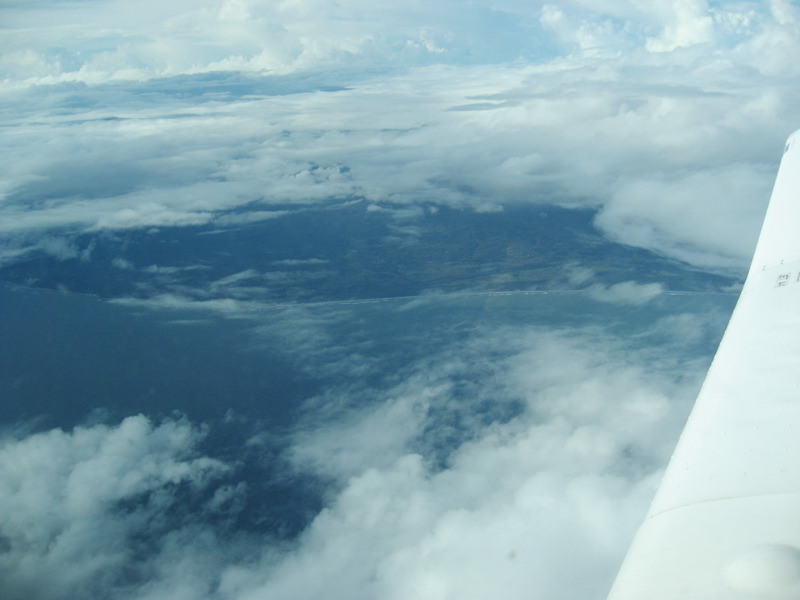 Below you can see the coastline through the airplane window as we headed north up the west coast of Papua New Guinea. 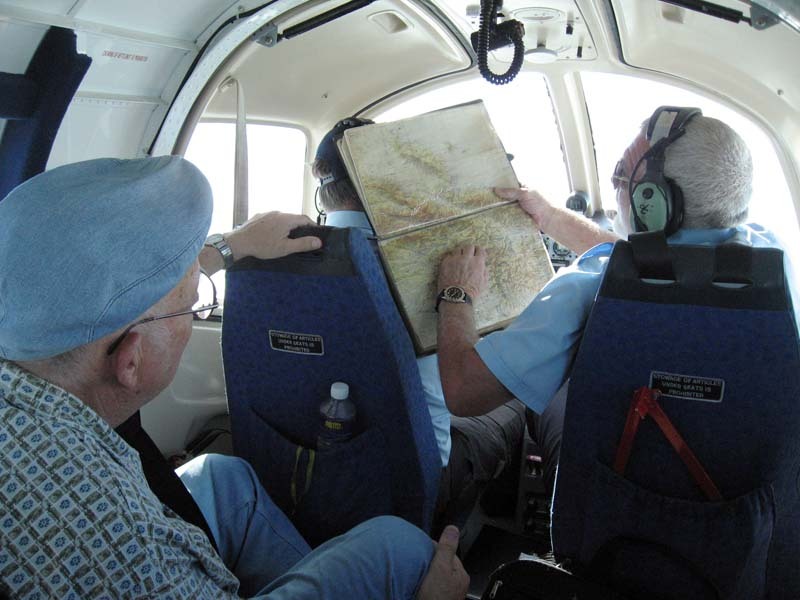 The co-pilot points out our location on his maps, then passes around the maps. 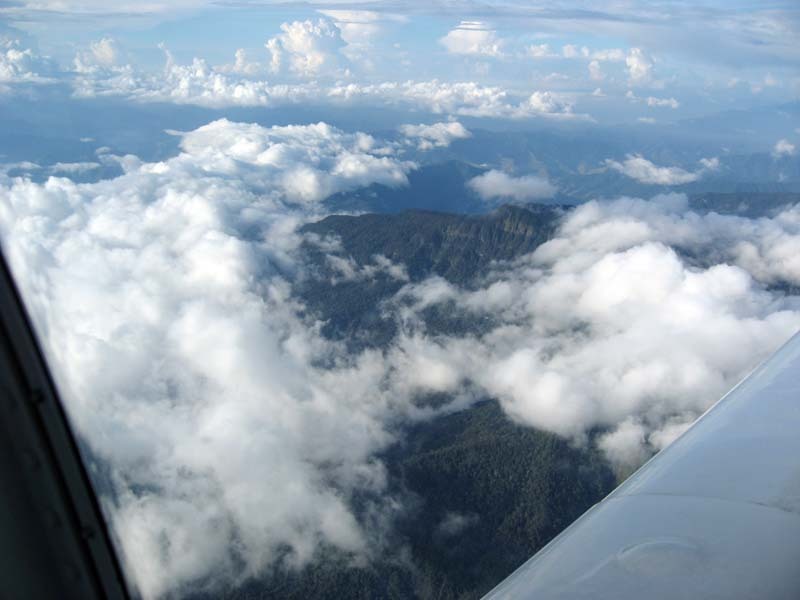 In the picture below we have headed inland over the "Western Highlands" of Papua New Guinea which is world famous rugged area with very few roads. 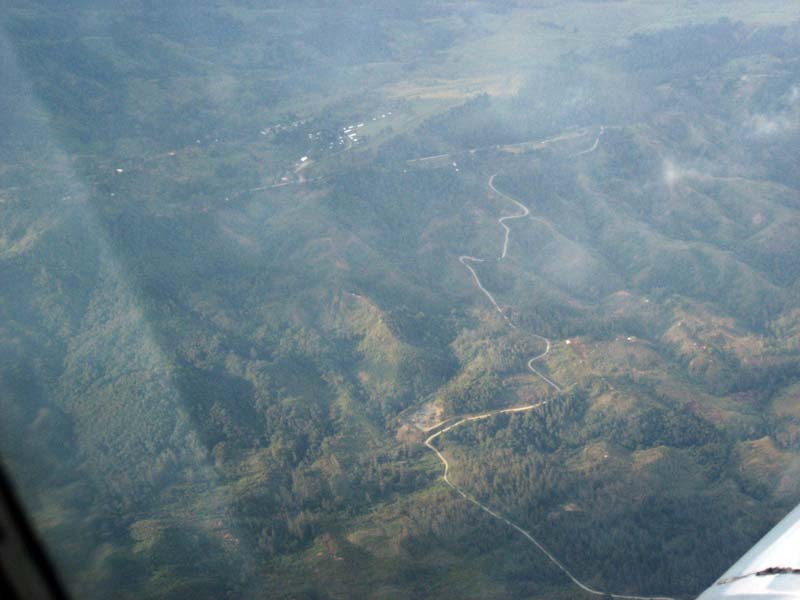 Below is rugged highlands of Papua New Guinea, with some villages and roads. Rugged highlands terrain. Notice the smoke plums rising from a couple of places, the locals are clearing fields. More terrain with a few remote villages. More remote outback territory with a few roads. 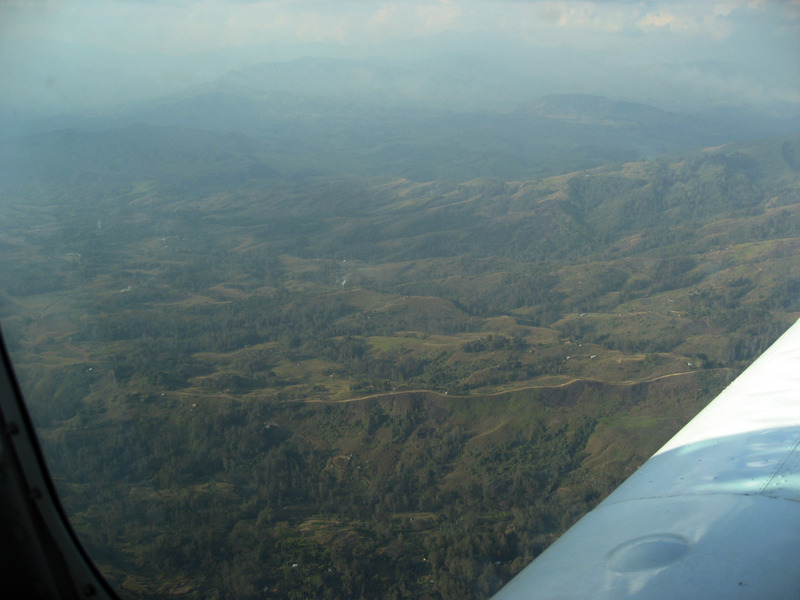 Some roads in the Highlands of Papua New Guinea tend to follow the tops of mountain ridges, you can see one below. 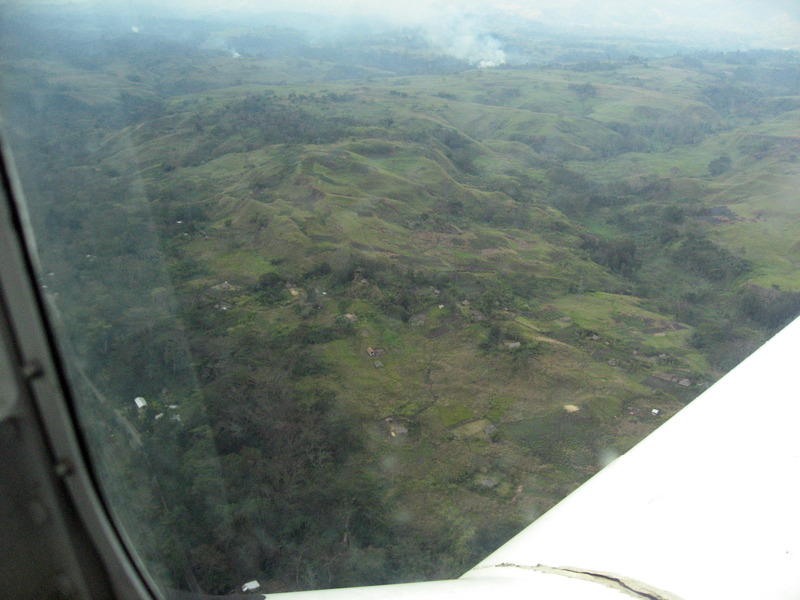 Here we come closer to Goroka, you can see more population density starting to appear. 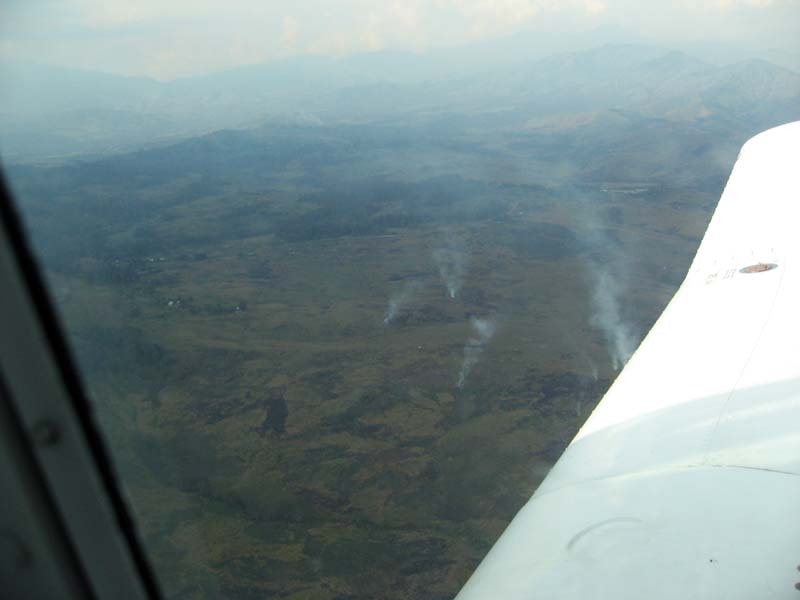 We're now descending into Goroka Airport, you can see more field burning, and the gardens (fields) of the locals are emerging. I think that's a paved road below, there is definitely more civilization since we were here last 35 years ago. 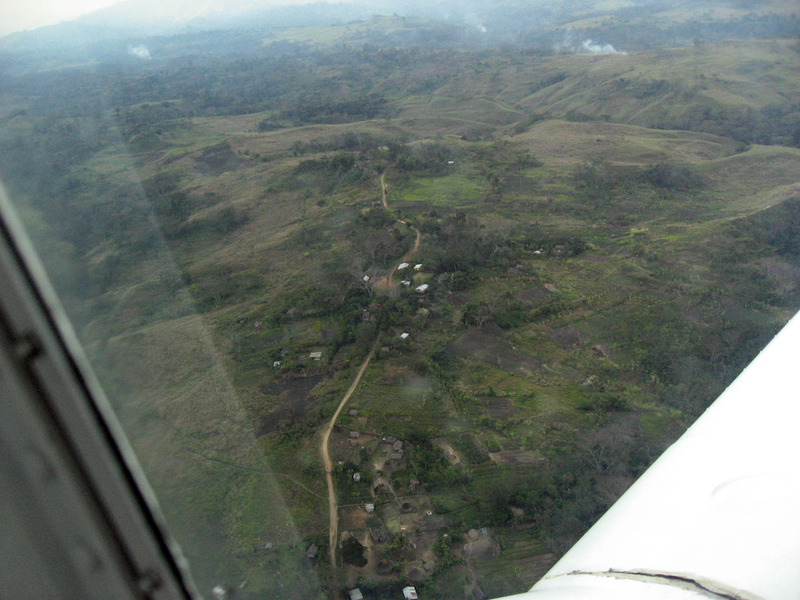 If you click on the picture below you can see detail in the homes and roads and fields outside of Goroka, Papua New Guinea. 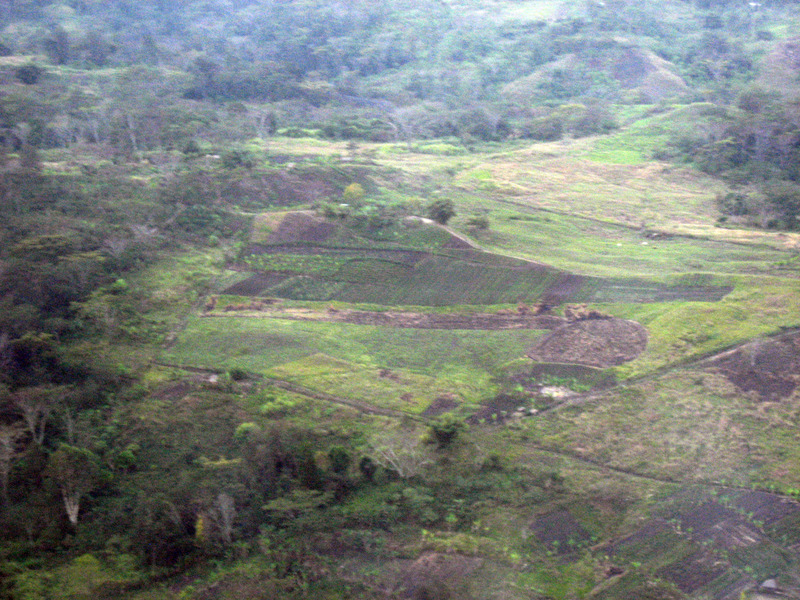 The picture below shows a lot of definition in the fields (we called them "gardens" when were were here 35 years ago) in Papua New Guinea. 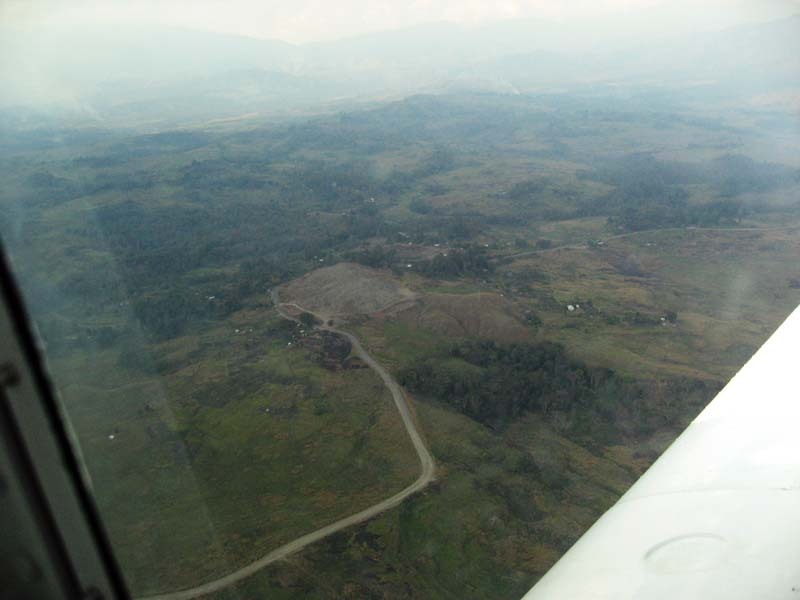 Here we have landed in Goroka, and are taxing towards the private terminal. 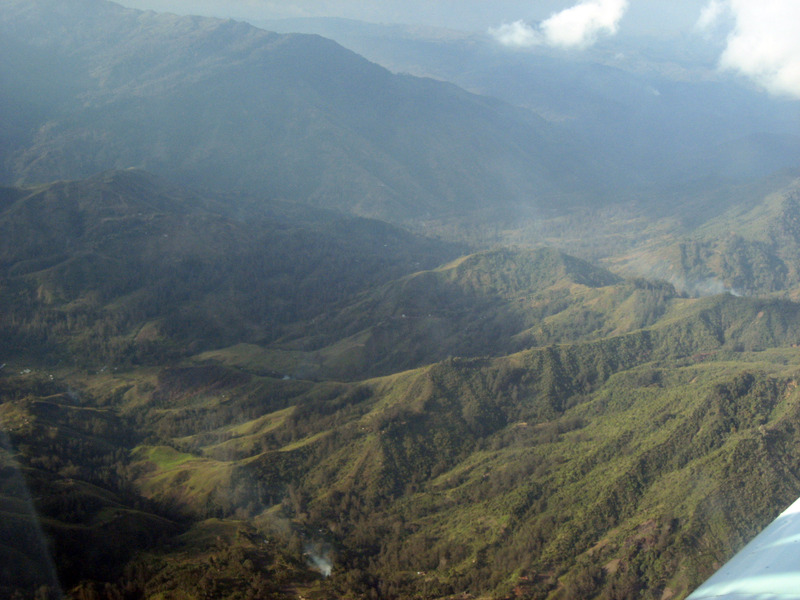 Howard Wilson's triumphant return to Goroka, Papua New Guinea, after a 35 year absence. 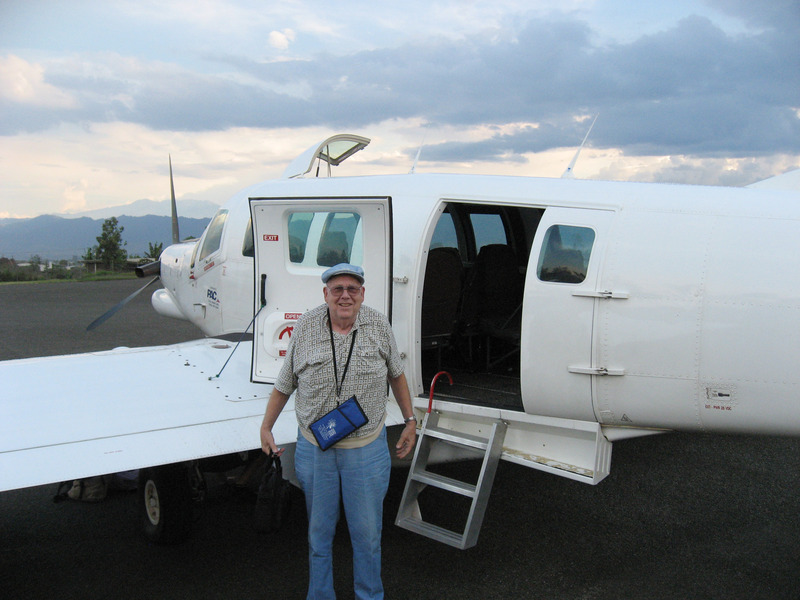 Here he is in front of our charter flight that just dropped us at Goroka Airport. Below are the family that lived here 35 years earlier (missing is Randy who arrived the next day). In the center are Virginia and Howard Wilson (my parents), on the left is Cheryl (my older sister), and me (Brian) on the far right. 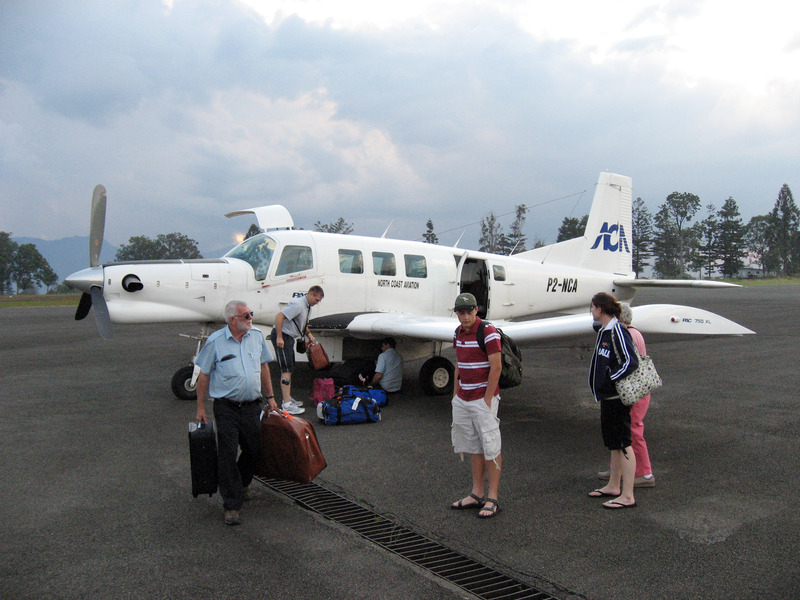 The pilots helped us with our luggage and called the Bird of Paradise hotel in Goroka to come pick us up. 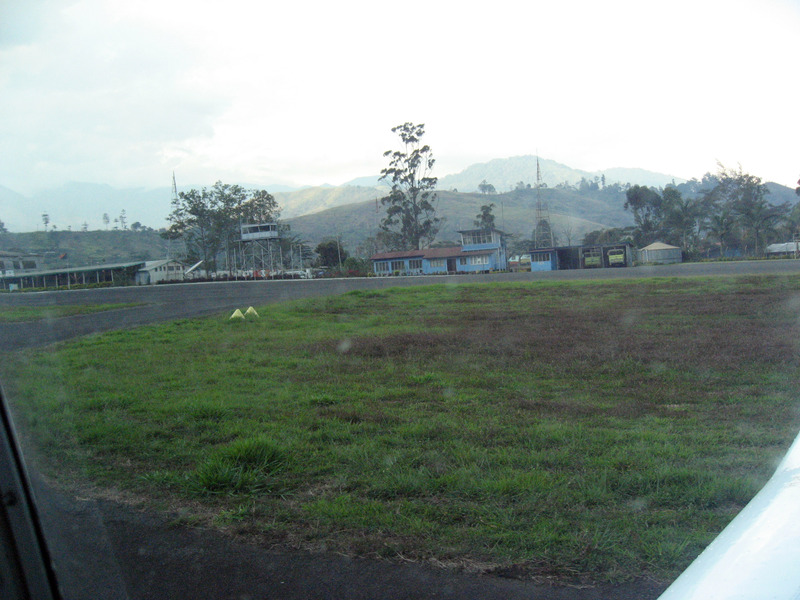 Below is the "private terminal" we stopped at. The Bird of Paradise couldn't find a driver to pick us up, so the airport fire department gave us a quick 2 block ride in their yellow fire pickup truck to the hotel. 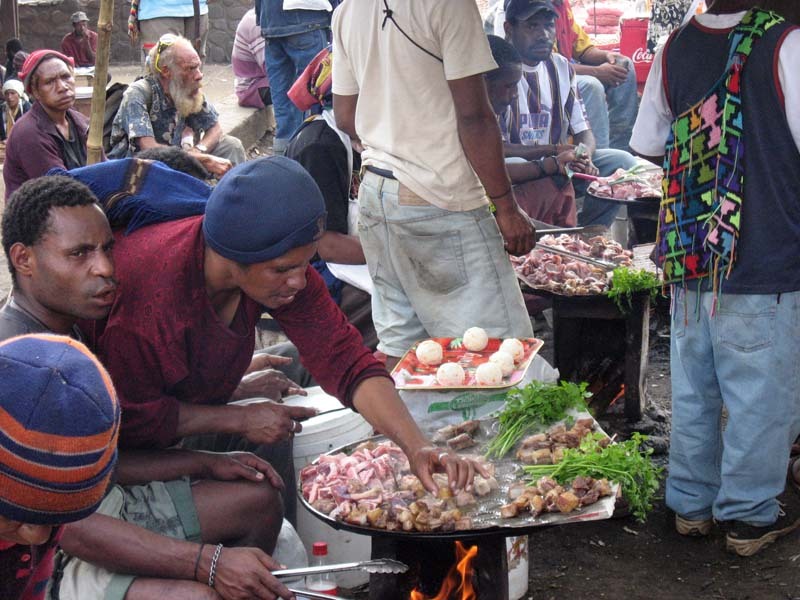 This next picture is out of order (showing a picture of Ari Echt-Wilson on the far left who didn't arrive for another day), but it shows "The Deck" restaurant at Bird of Paradise Hotel in Goroka. 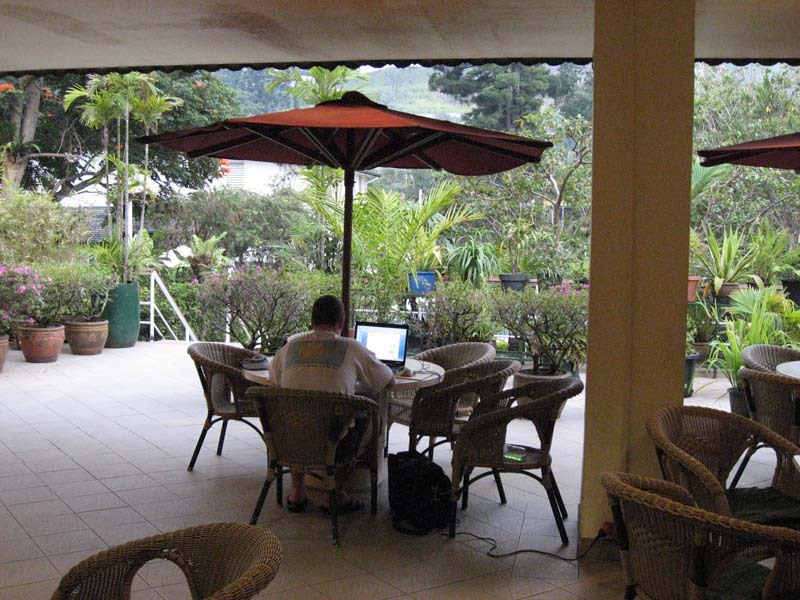 "The Deck" was open air which is fine in the tropics (it was never cold), and was a very good restaurant food-wise. 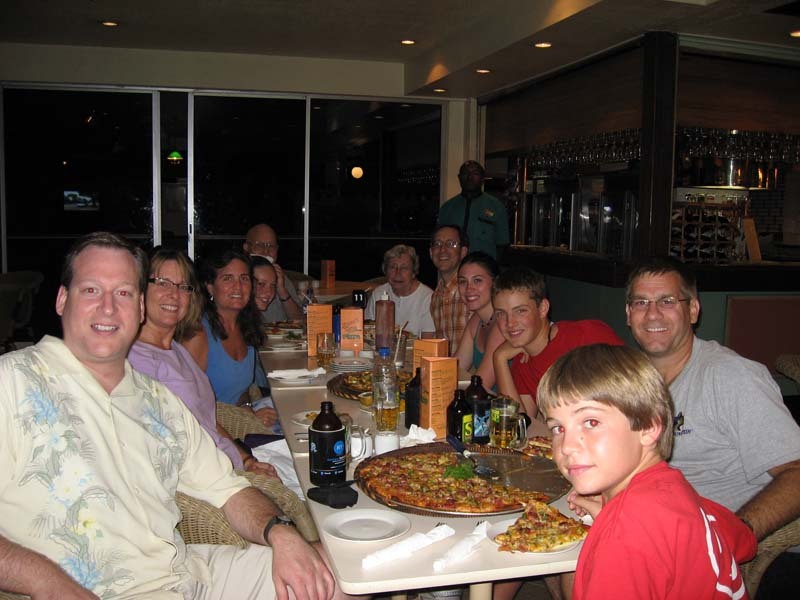 Sometimes it was a touch confusing for us how to order which things from the menu (some they took your order at the table, others you walked up to a counter, other items seemed virtually impossible to order by any means). But the staff was always courteous and as helpful as they could be. 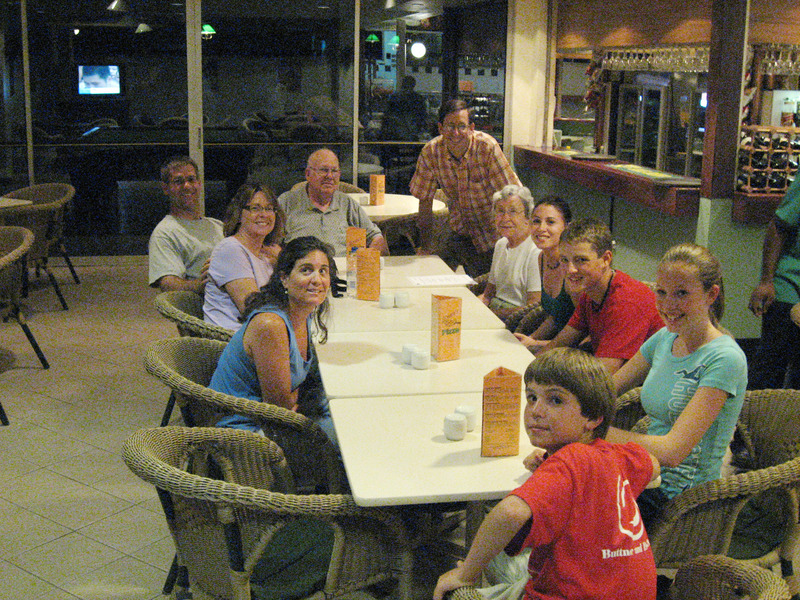 Another picture from "The Deck" restaurant where we ate most of our meals over the next couple days. 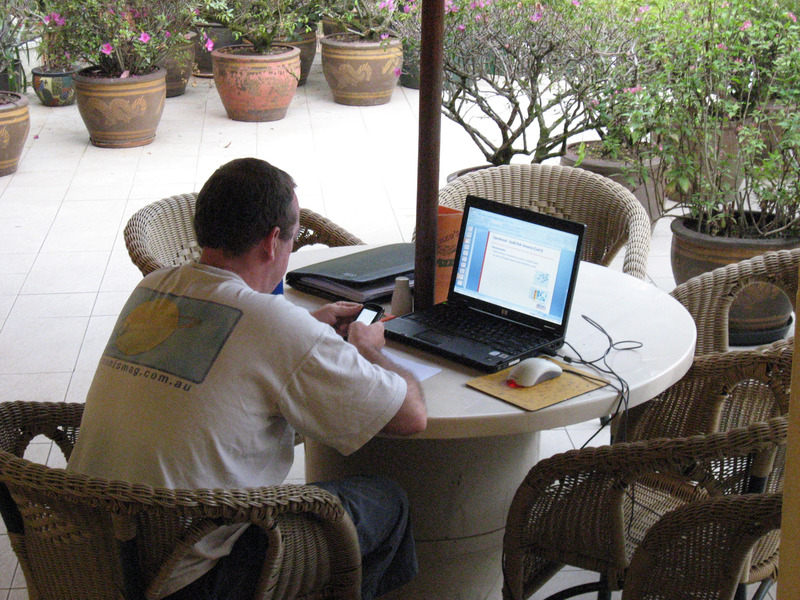 This random business traveler had his laptop and cell phone and was working. Down the steps to the left in this picture is the pool. A close up over the shoulder of the guy working on his laptop and cell phone. OH, a note about cell phone coverage. My ATT tri-band Nokia phone from the USA roamed fine in Australia and even in Port Moresby (the capital of Papua New Guinea), but ATT did not have a relationship with the local cell phone company in either Goroka or Madang, so my phone did not work. 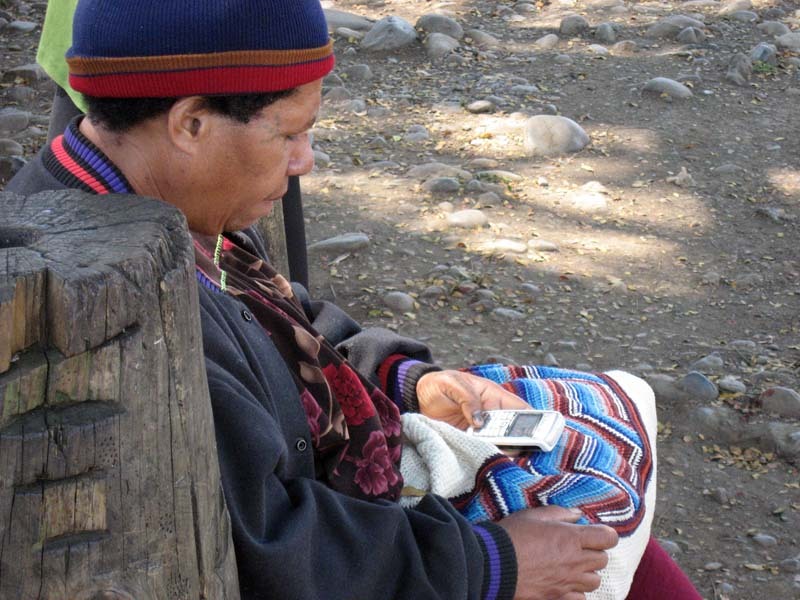 Two of our family had "Verizon Global Roaming Phones" and Verizon *DID* have relationships in Goroka and Madang so their special loaner "global" phones worked. You must ask Verizon for one of these phones before you leave the USA. 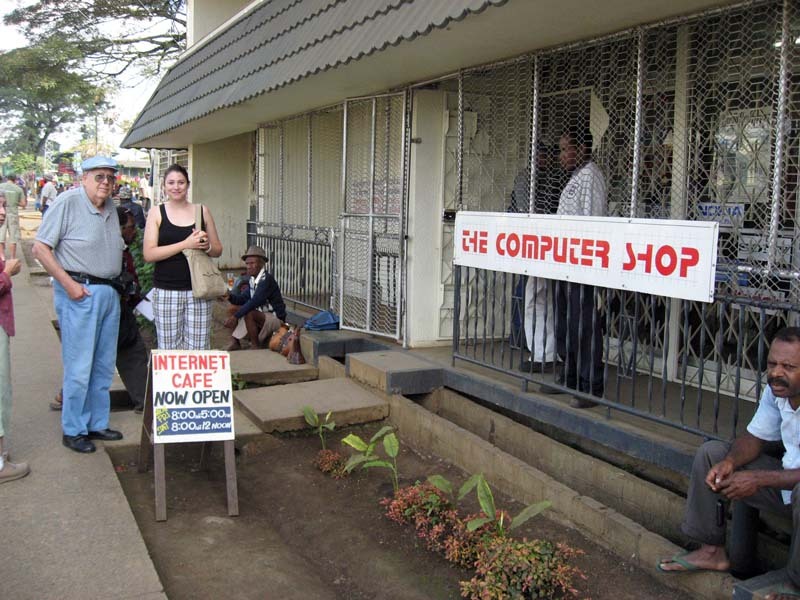 Just to be clear, they use GSM in Goroka, and my phone displayed the name of the local carrier and had plenty of signal and spoke all the correct protocols, but I was not allowed to use the phone because ATT has no roaming relationship where Verizon went to the trouble of establishing a roaming relationship with the local Goroka company. This is especially interesting because Verizon in the USA uses CDMA (not compatible with GSM) which is why Verizon supplies it's customers with a totally different cell phone (loaner, for free) to wander abroad with. 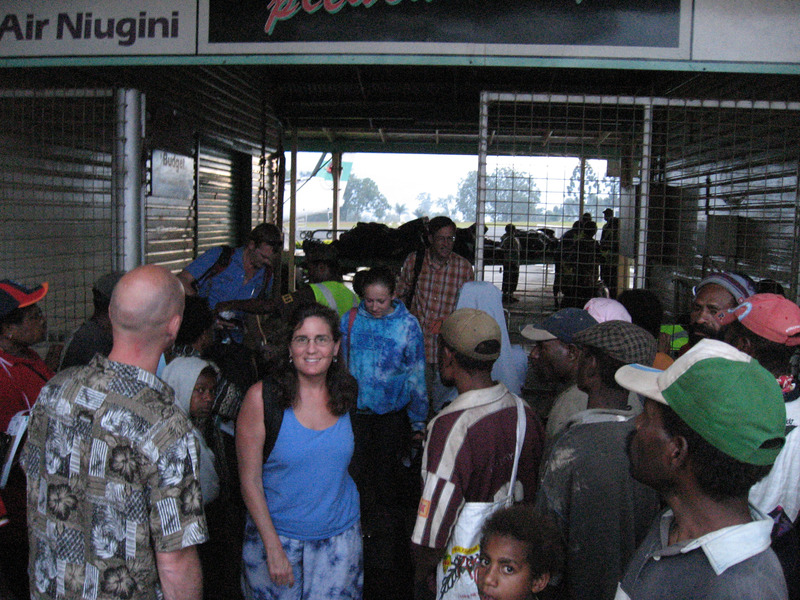 The next morning we walked from the Bird of Paradise hotel down to the "Saturday Market" in Goroka. Here we are immediately outside the Bird of Paradise hotel talking with street venders of native arts and crafts like baskets, stone axes, etc. 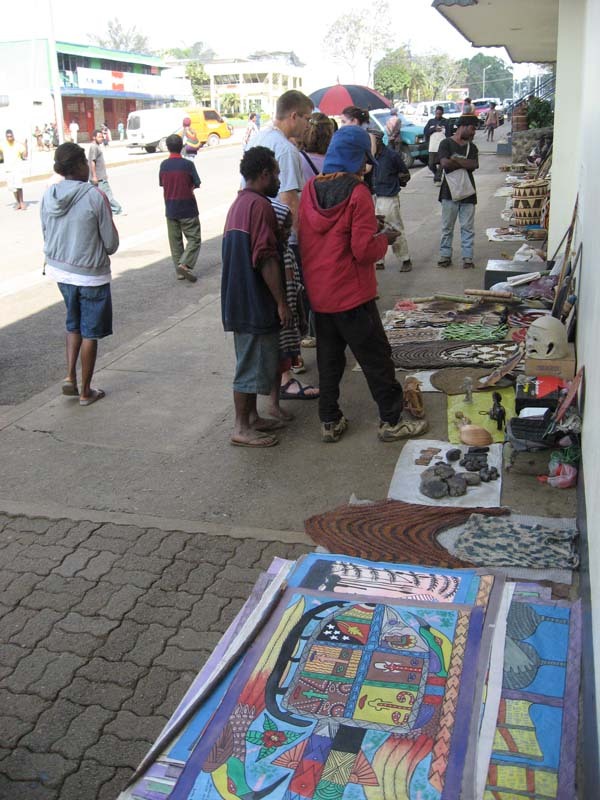 A selection of crafts available on the street right outside Bird of Paradise hotel in Goroka. 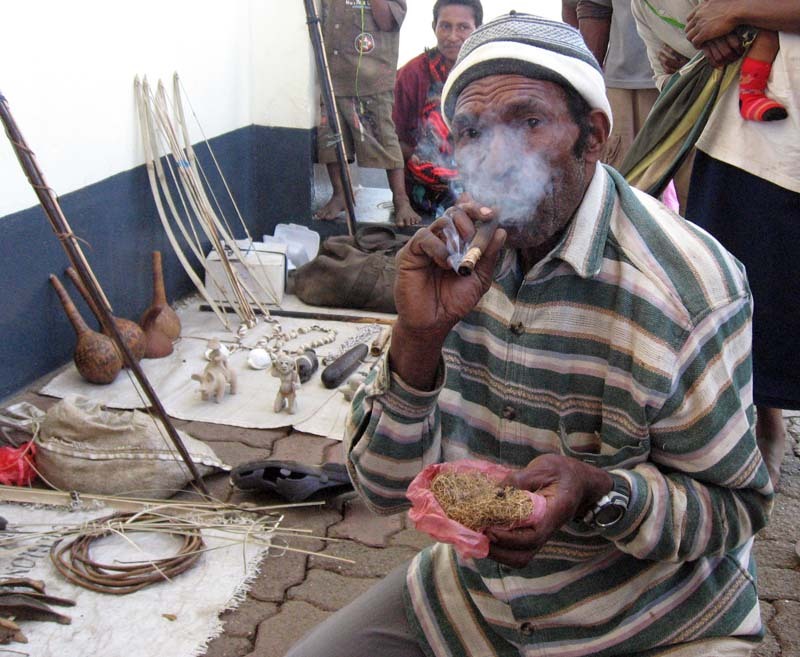 There are baskets, stone axes, bow and arrow sets, bracelets, necklaces of boar tusks, billums, carvings, etc. A little way down the street (still about half way to the Saturday market) is a section of street dedicated to billum bag sales. 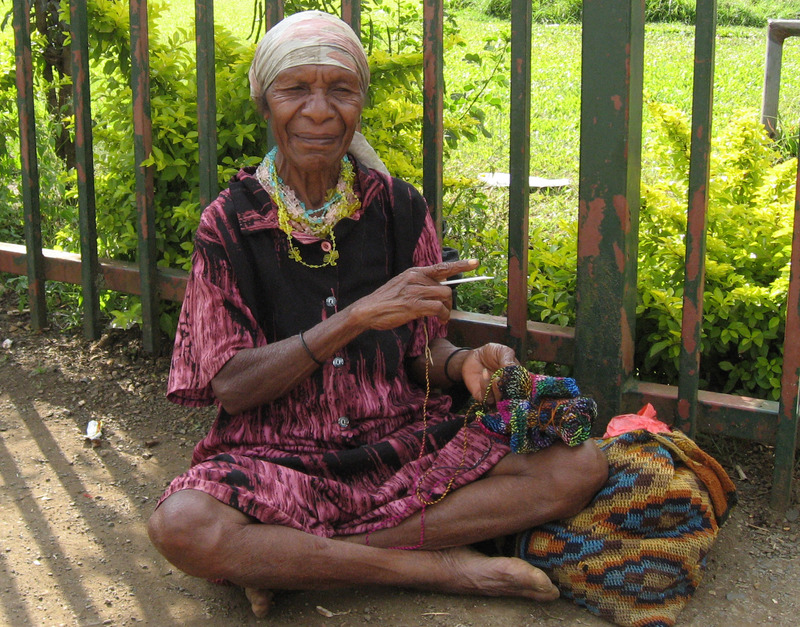 A "billum" is a very traditional Papua New Guinea woven, knitted, or crocheted from yarn or local fibers or pretty much anything nowadays. The picture below shows a spectacular array of Billums for sale. 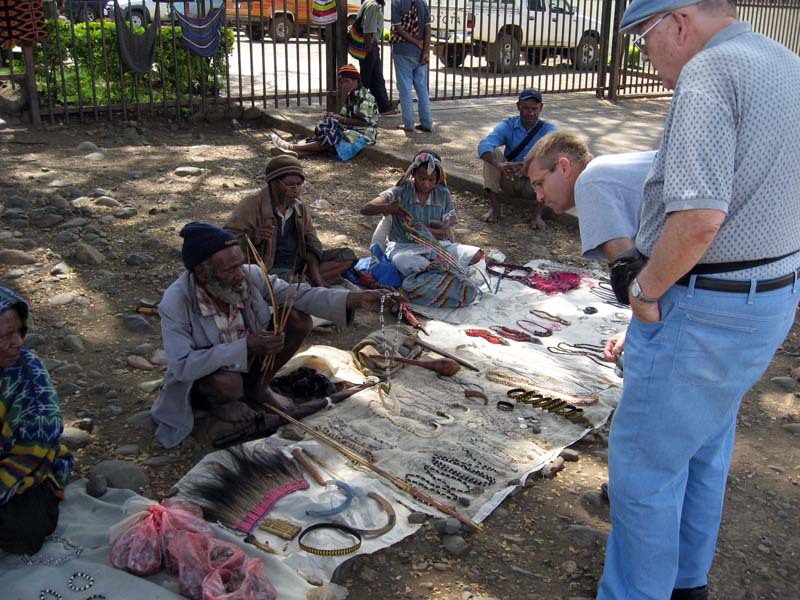 They vary in price based on construction or raw materials or size, but in general they are about 50 PNG Kina (about $20 USD) each. 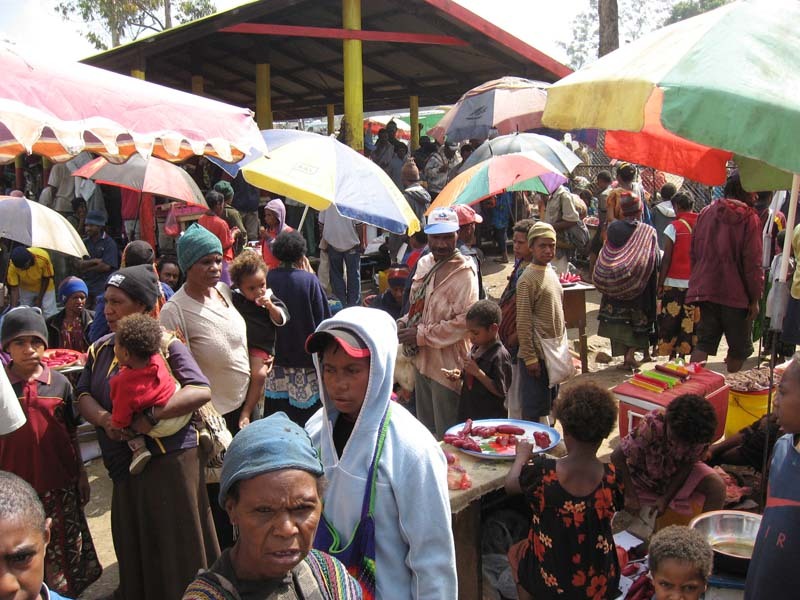 It became clear that making and selling billums is traditionally a woman's job here, and the "Marys" (Tok Pisin term for "woman") were out in force in this area. 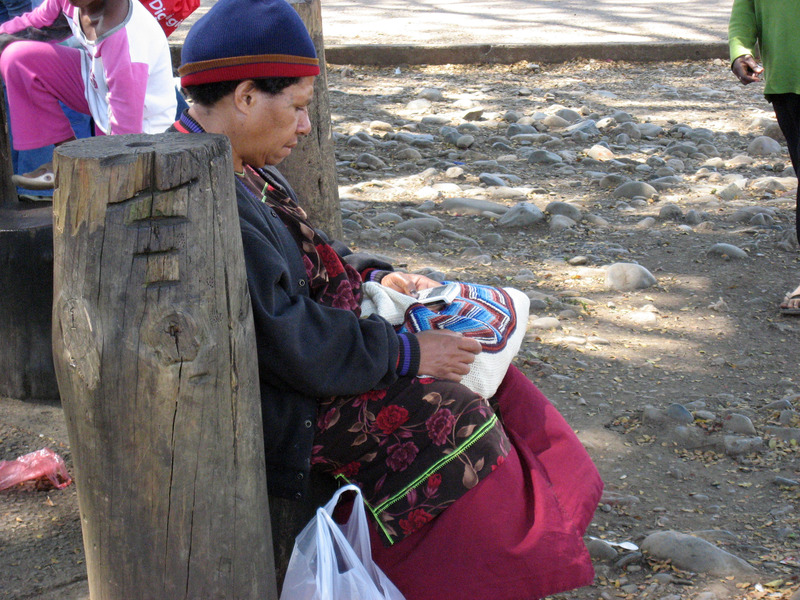 We also heard the older women referred to as "Momma" in Tok Pisin kind of used as a sign of friendliness or respect. A few more feet down the way is the Goroka Post Office. I don't know what this was about, but in the picture below is an armed guard armed with a humongous machete. 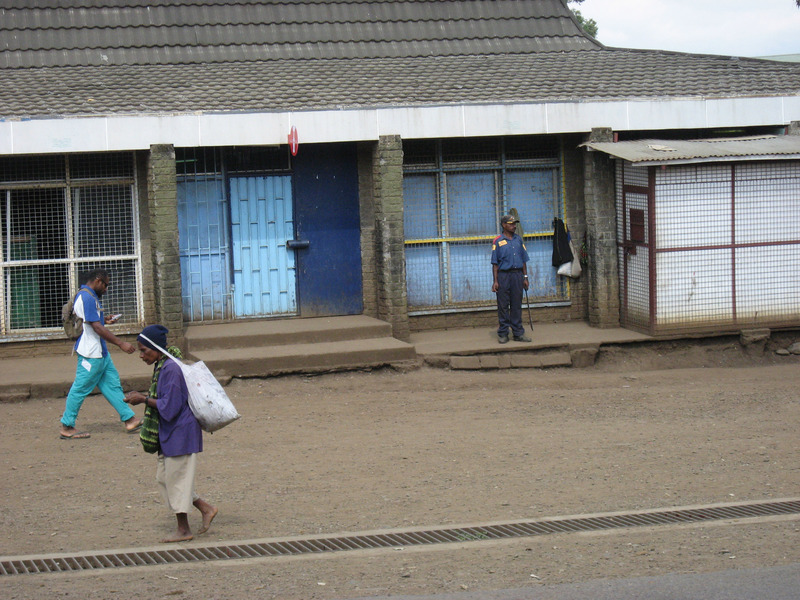 He was there guarding this building for all 3 days we were in Goroka. 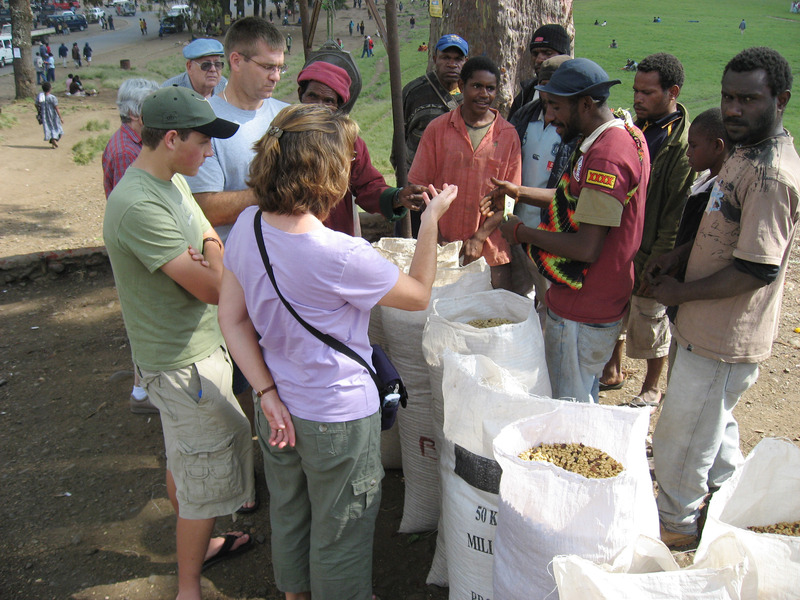 Below are some local coffee buyers in Goroka. The small coffee farmers in the area walk up with very small amounts of coffee beans, and these men negotiate then purchase the raw coffee accruing it in the large bags you see below. Then they take it to their coffee factory (there were 4 or 5 coffee factories within a few minutes of town) where they prepare it first by drying and cleaning it, then roasting it. 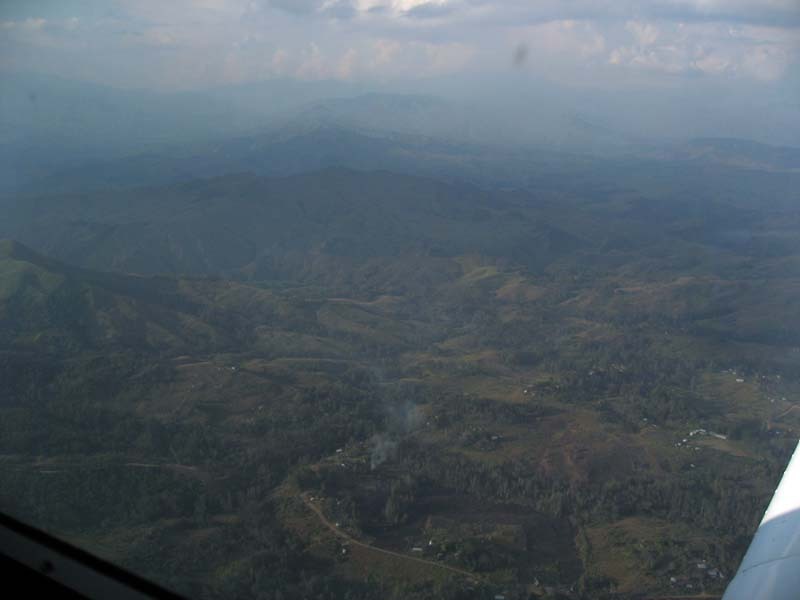 At the far left of the picture below is the Goroka Market in the distance, and to the right stretches out what I would call the "Cricket Field", although I don't know if it's still used for that purpose anymore. I remember this place from 35 years ago, when I was 4 years old. This is the first place that looked familiar to me on this trip, I remember it clearly. 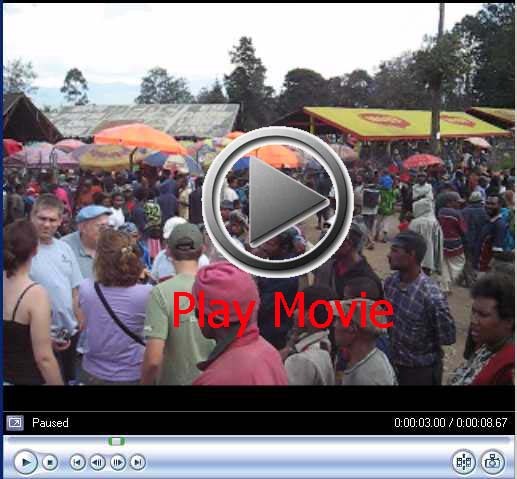 Click the "Play Movie" button below to watch a short 10 second YouTube video of the crowd and noise just outside the Goroka Market. For WINDOWS ONLY Click Here for a MUCH HIGHER QUALITY Windows Media format movie. 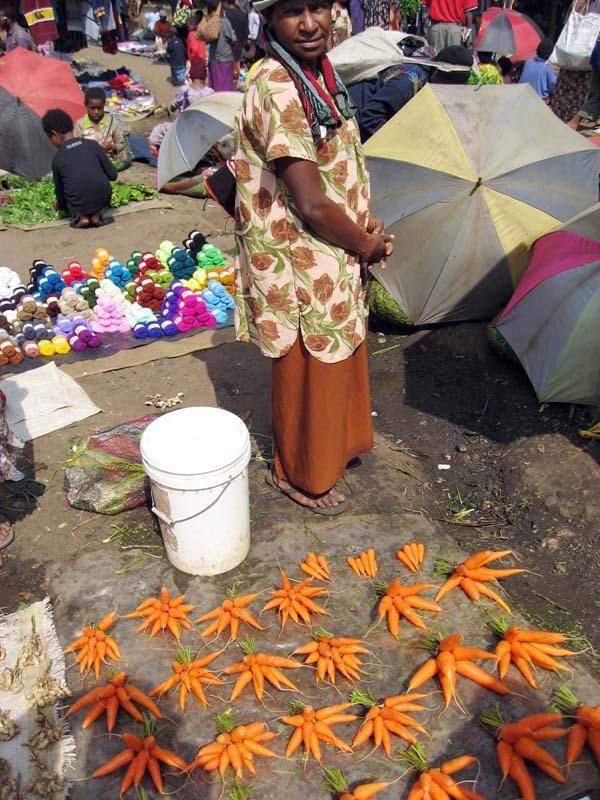 Walking through the Goroka market, what follows is about a hundred pictures of various people selling random things. :-) I'll make small comments, feel free to correct me if you notice an error. 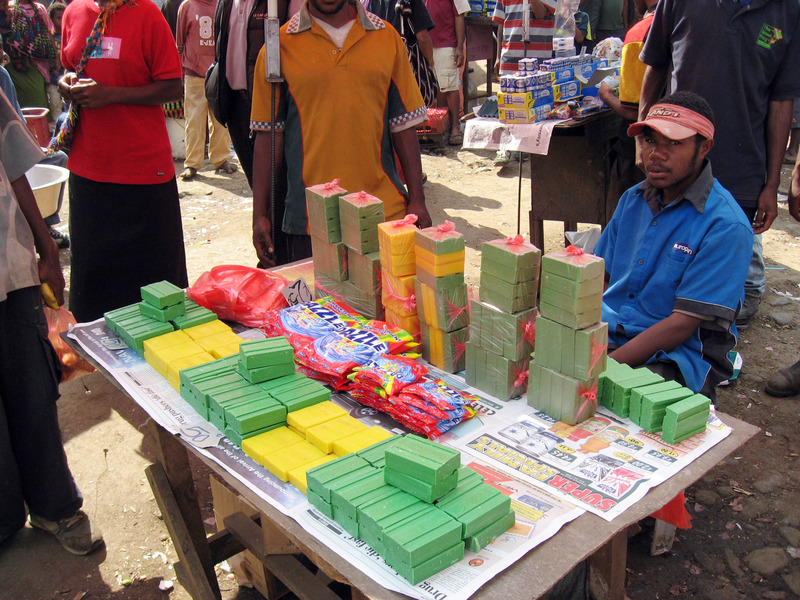 Below a guy is selling soap clearly not made in a western style soap factory, but reasonable quality none the less. 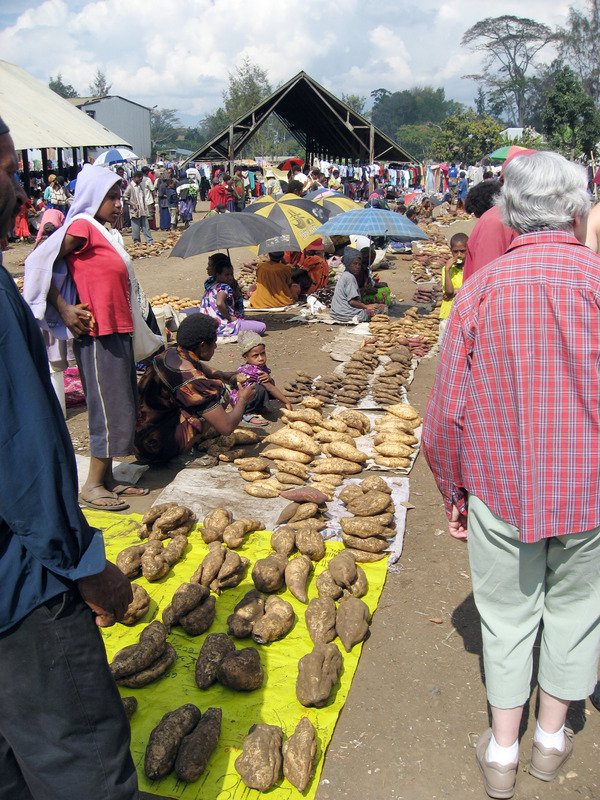 Lots of people in the Goroka Saturday market. Yarn for sale (imported from China mostly). I don't really understand the economy here but this is my guess: Most of the things for sale are locally grown farm produce, but some things (like the yarn below) is simply imported and the sellers in the market are acting as resellers, importing the yarn and marking the price up a little and making a profit. 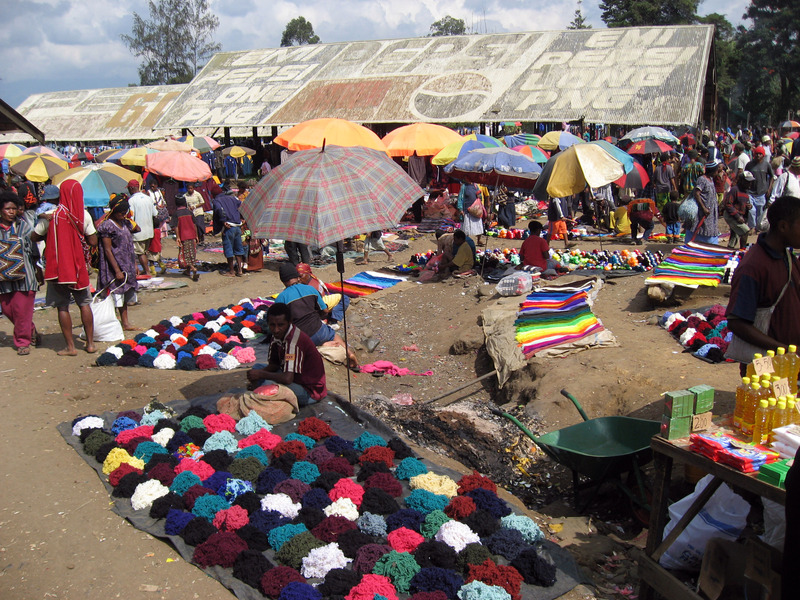 Oil, rice, corn, yarn, all for sale in the Goroka market. The carrot sellers kept the carrots moist by sprinkling water on them all day, the carrots looked excellent but the water being sprinkled looked more than a little dirty. :-) Later some of our family bought, peeled, and ate carrots and were perfectly healthy afterwards. Mark Hoffmann (my brother in law) and a row of really good looking fresh produce. 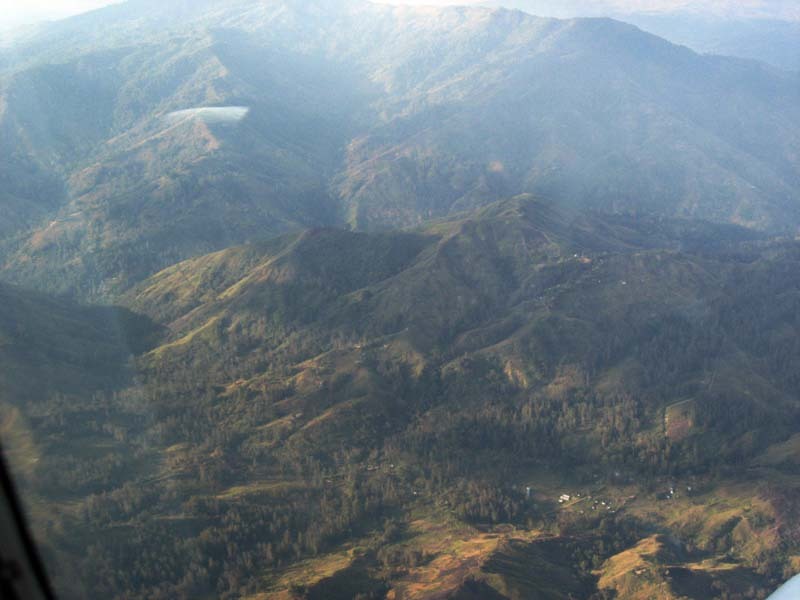 We were told that the "inland" highlands region (around Goroka) was able to grow broccoli and other greens that don't grow well in the hotter coastal regions. The locals universally called the plant below "Kau Kau" which I would call "yams" or "sweet potato", but I think there are several varieties of kau kau which I cannot distinguish between. More kau kau (sweet potato). And even more Kau Kau! 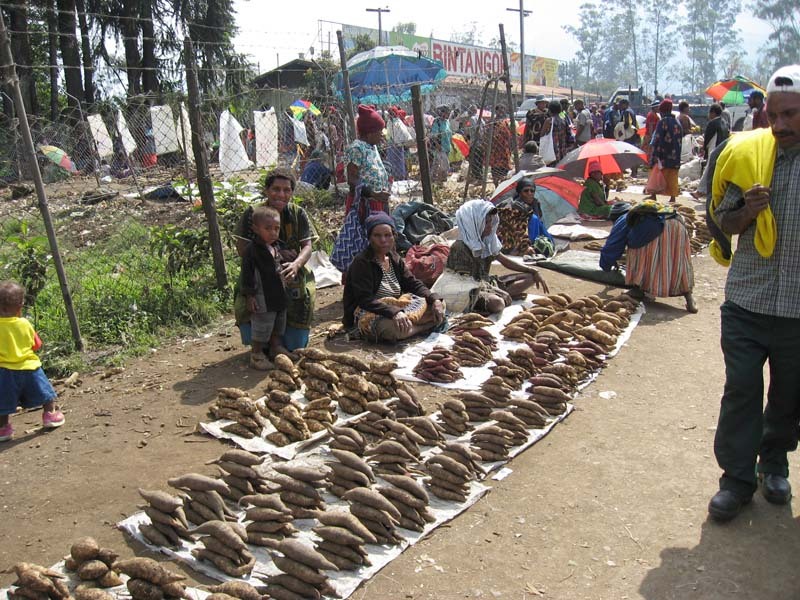 Lots of it for sale in the Goroka market. 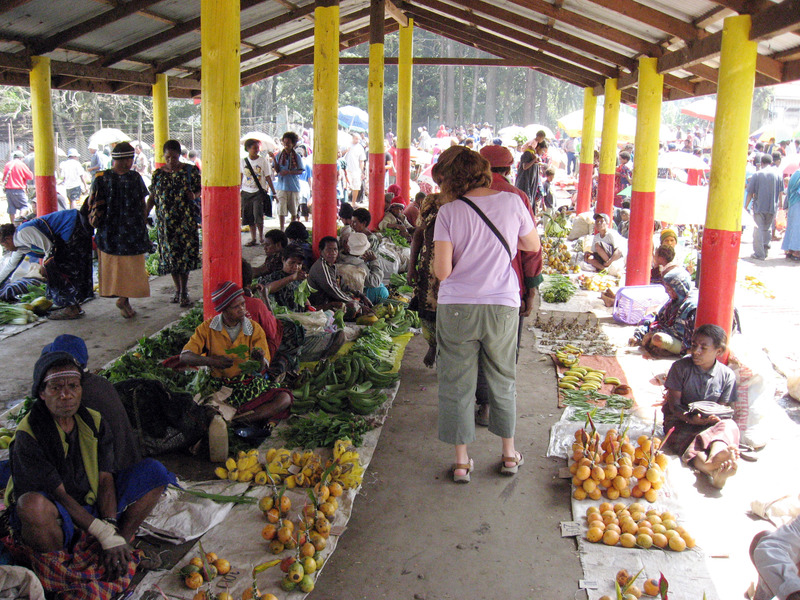 Below is a panorama of the Goroka Saturday market to get an idea of the size and layout. 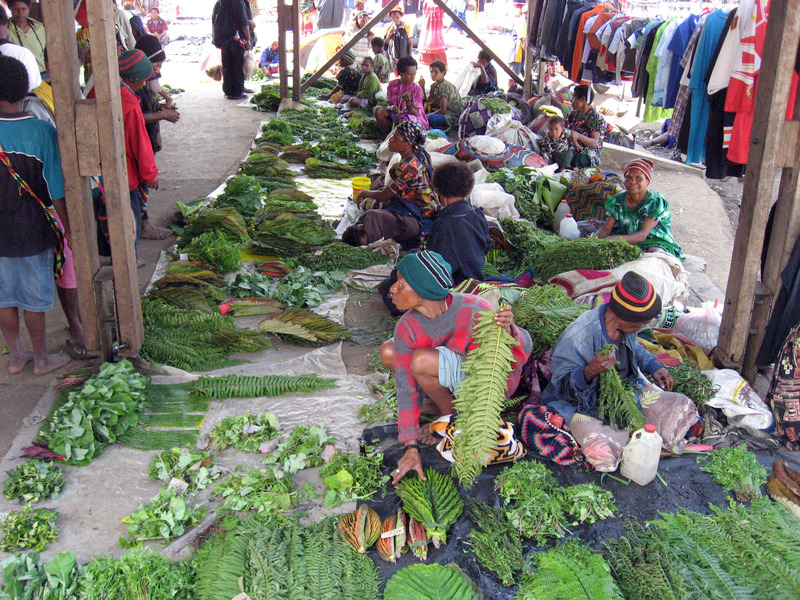 Greens for sale under the roofed areas at the Goroka market. 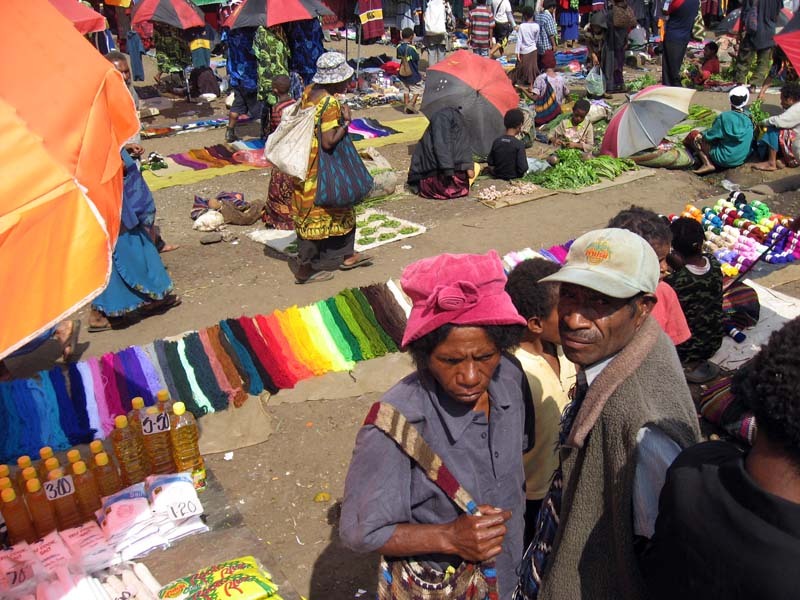 Below is an assortment of random manufactured stuff you might find in a drugstore in the USA, but this is spread out on a tarp in the Goroka market. 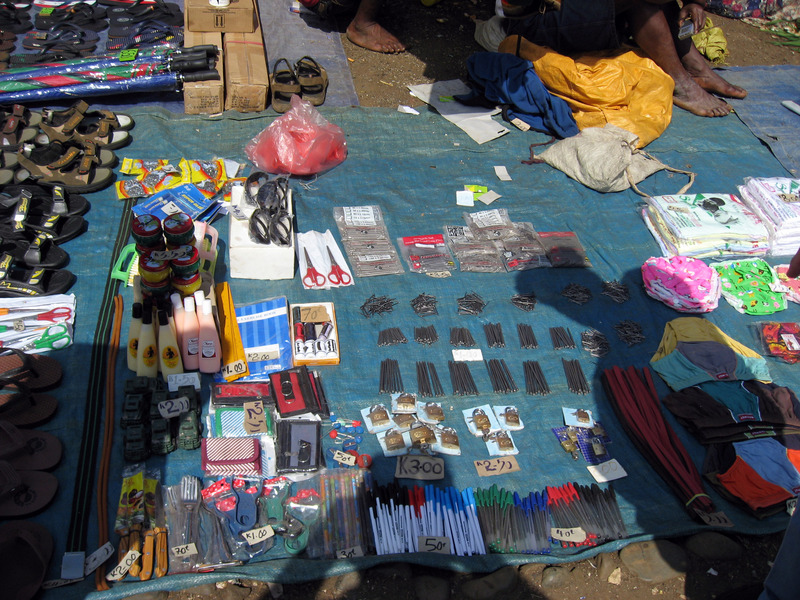 Those are nails for sale, padlocks, pens and pencils, forks, sunglasses, and scissors. Click on the picture below for a closer look! Sandals and shoes for sale at market. 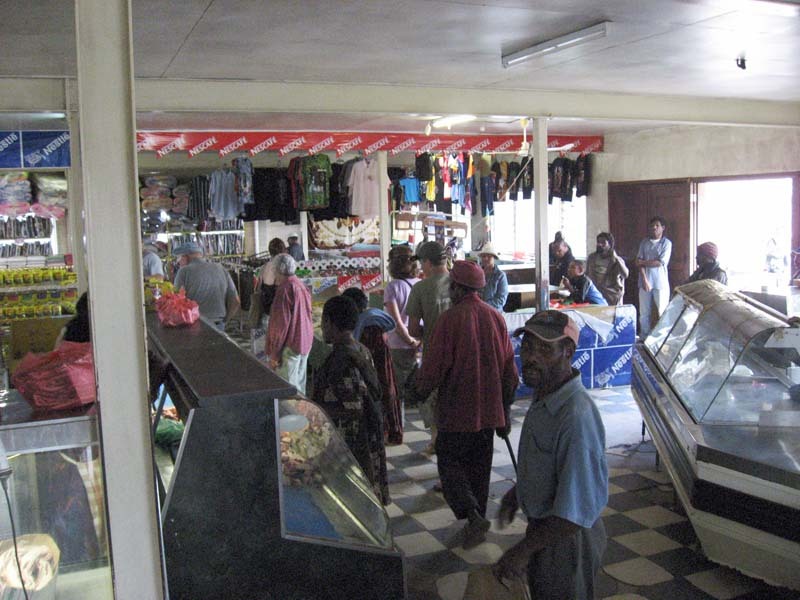 Below is the tobacco aisle in the Goroka market. 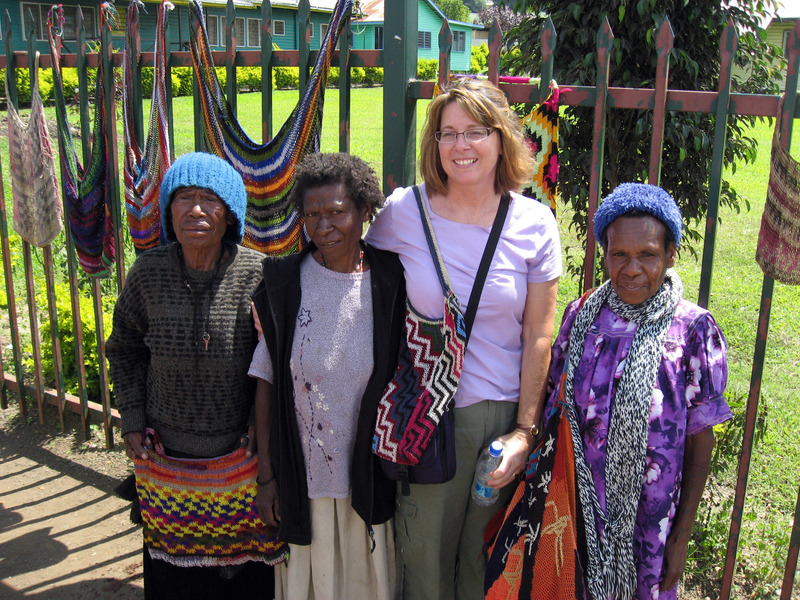 Below are locally sewn brightly colored dresses. The material is imported from China, then sewn with machines by local women (we noticed machine hems and machine stitching). 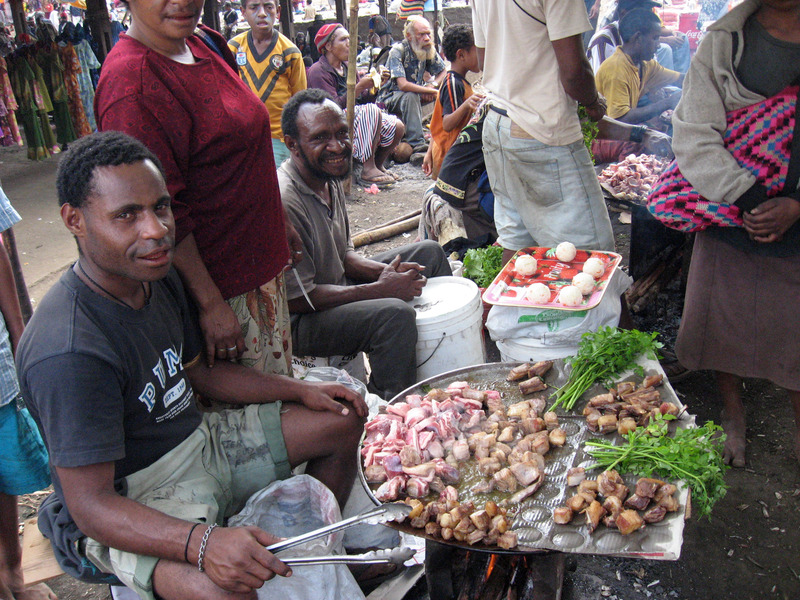 On one side of the market was a "food court" where they cooked bits of lamb and pork on coal fired hotplates and sold each piece individually. 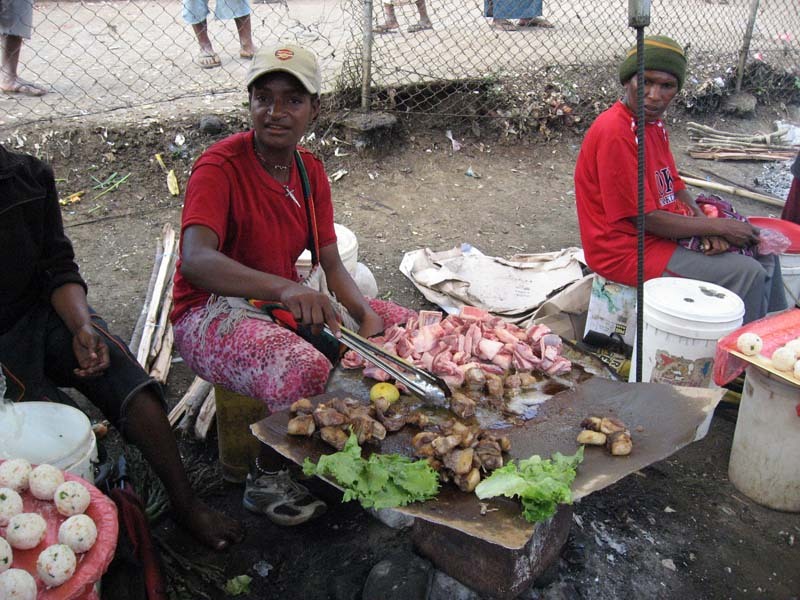 Here in the food court area we watched people walk up, choose a piece of frying meat, agree on a price (a few "toya" each, which are the equivalent of USA pennies), then the locals would pop the hot fried meat into their mouths. Lettuce was sometimes provided to wrap the hot meat in so it could be carried for a little while, but clearly meant to be eaten in the market. Fried yams I think? Locals would call it Kau Kau. Various fried delicacies in this row. If you look closely, the hot plates have cardboard on them that is soaked in cooking oil. As meat finishes cooking it is slid out on the cardboard away from the heat. 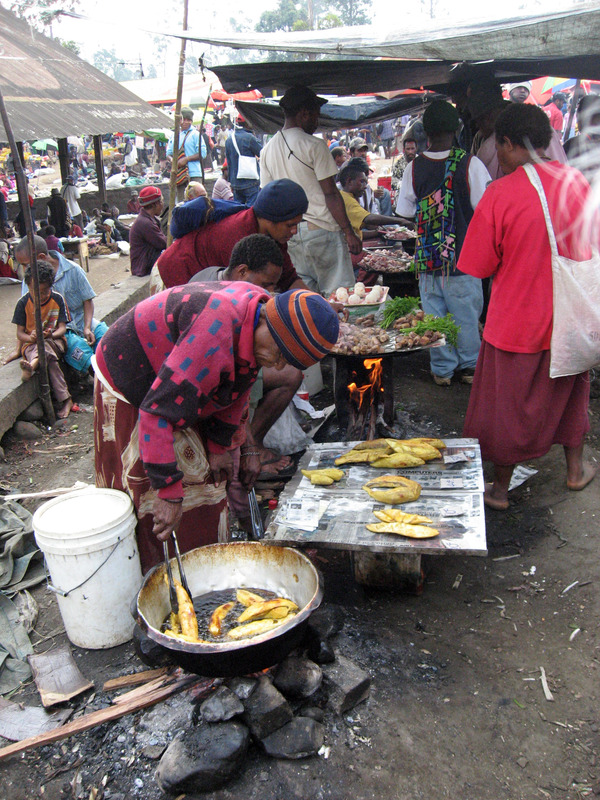 More fried stuff for sale in the fast food court in the Goroka Saturday market. 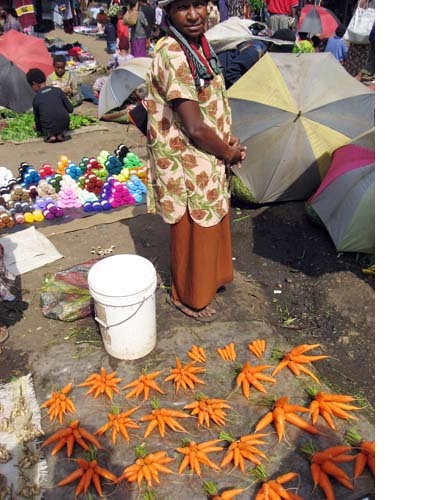 The woman below shows how a lot of the woman carried heavy loads - on their heads. In this example a large bunch of bananas. 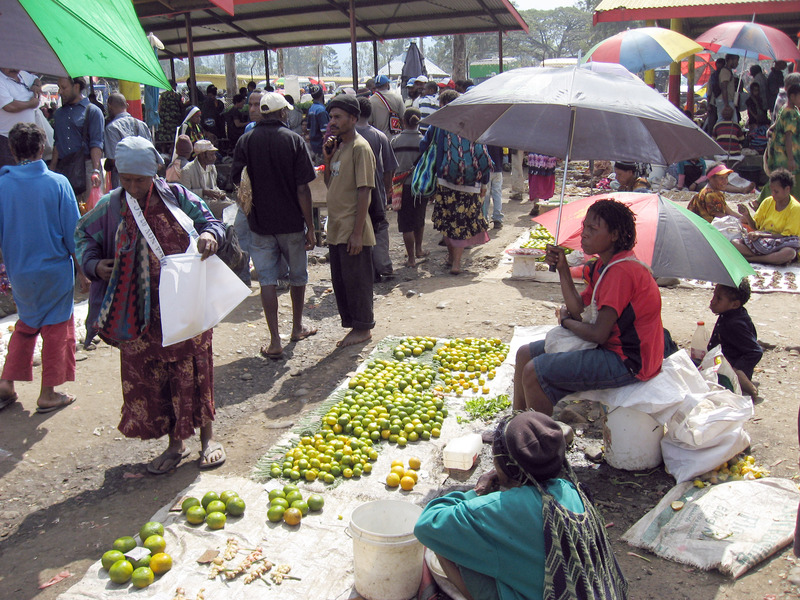 Fresh fruit such as oranges and bananas for sale in a covered area in the Goroka market. 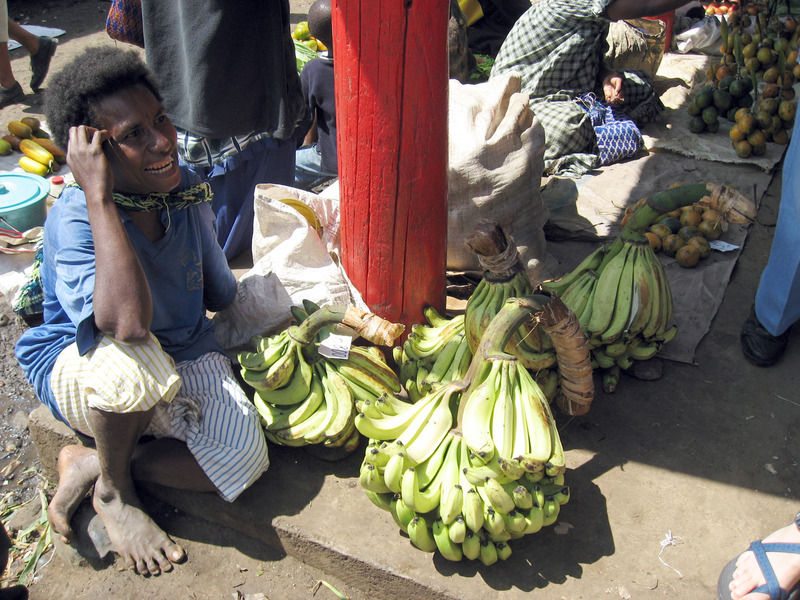 Bananas for sale in the Goroka market. 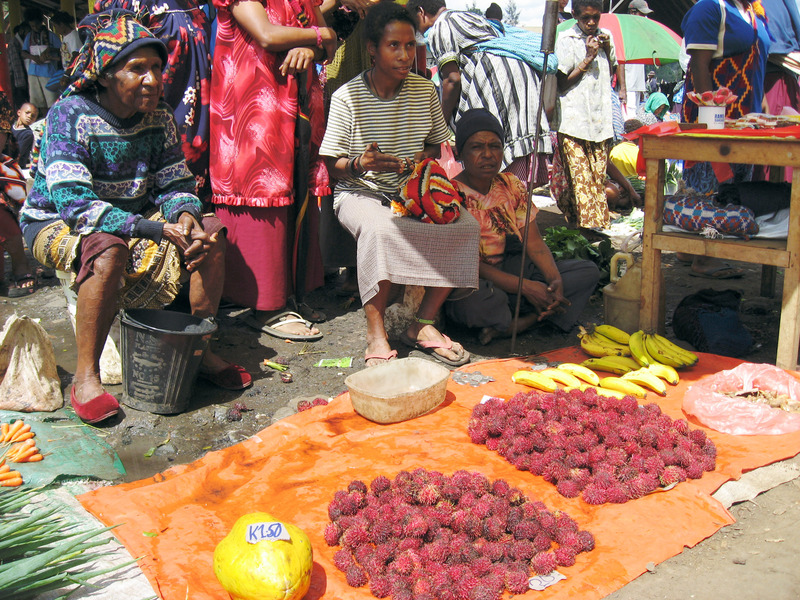 A mystery spiny red fruit for sale in the Goroka market. If you know what is pictured below, please email me! (My email address is at the very top and bottom of this web page.) One reader thinks it might be Lychee. Another reader thinks it might be Rambutan. What do you think?! 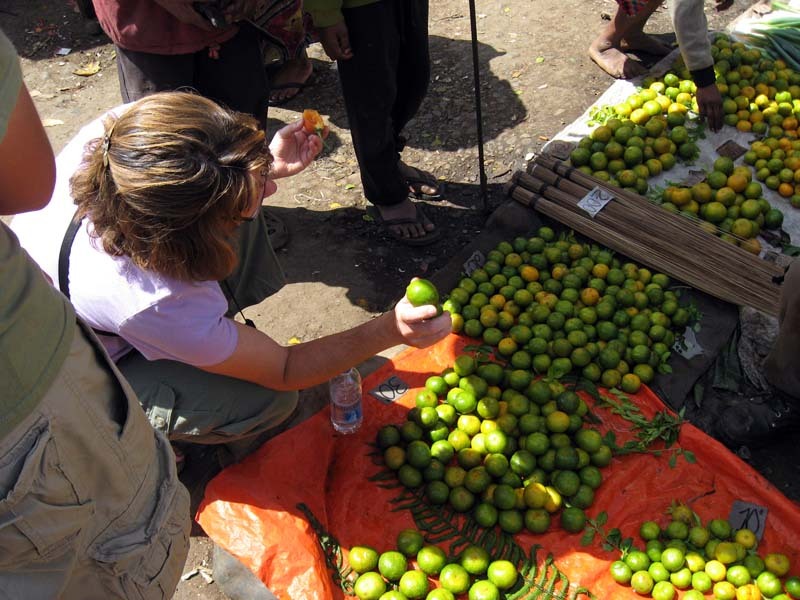 Limes for sale for 30 toya each (about 12 cents USD). 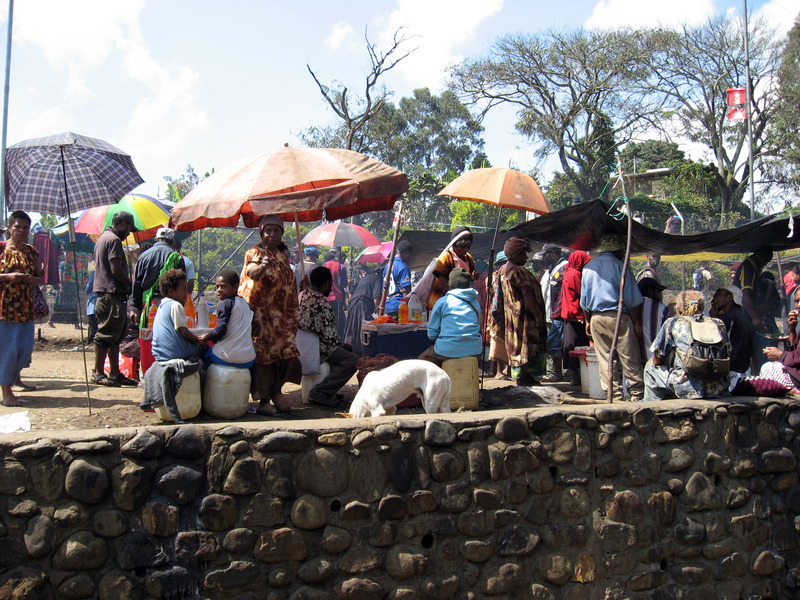 We walked back from the Goroka Open Air Market, and stopped in this more traditional store to buy some bottled water. On the way back to the hotel, Katie bought her billum from this "momma". Cheryl bought her billum from one of the mommas in this picture. Cheryl's new billum can be seen around her neck. 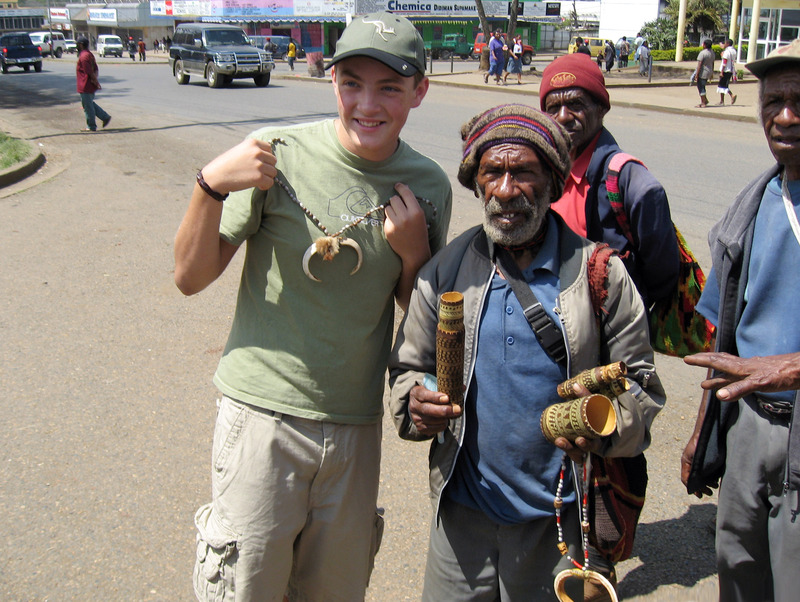 Nathanael bought a boar's tusk necklace from this guy. We bought some necklaces from this vender in Goroka. Everyone was very friendly. 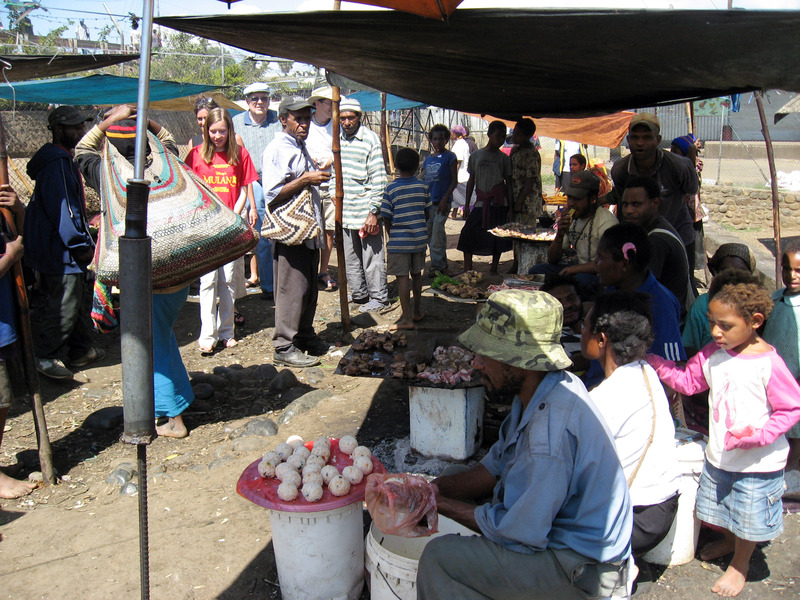 Shopping for bows, arrows, and necklaces made out of shells not far from the Bird of Paradise in Goroka. 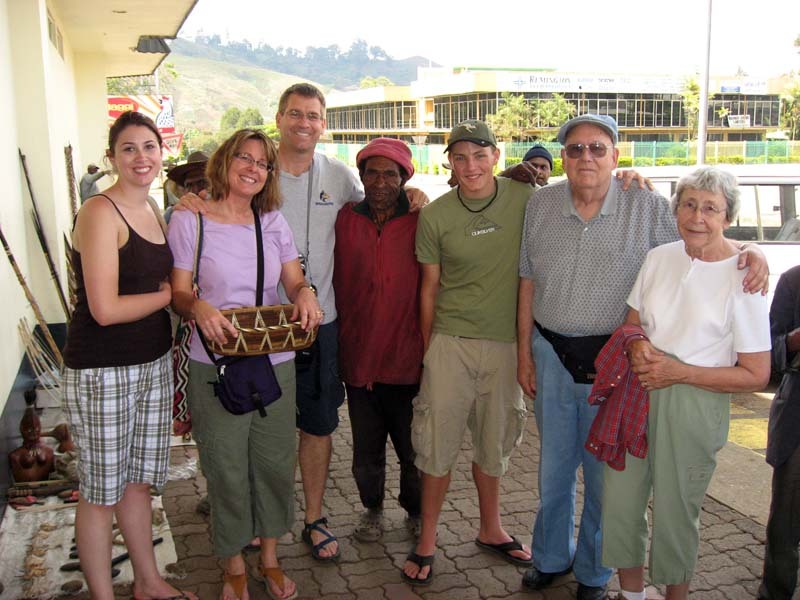 At around 6pm on July 26, 2008, Randy and his family finally arrived into Goroka, making the family reunion complete! 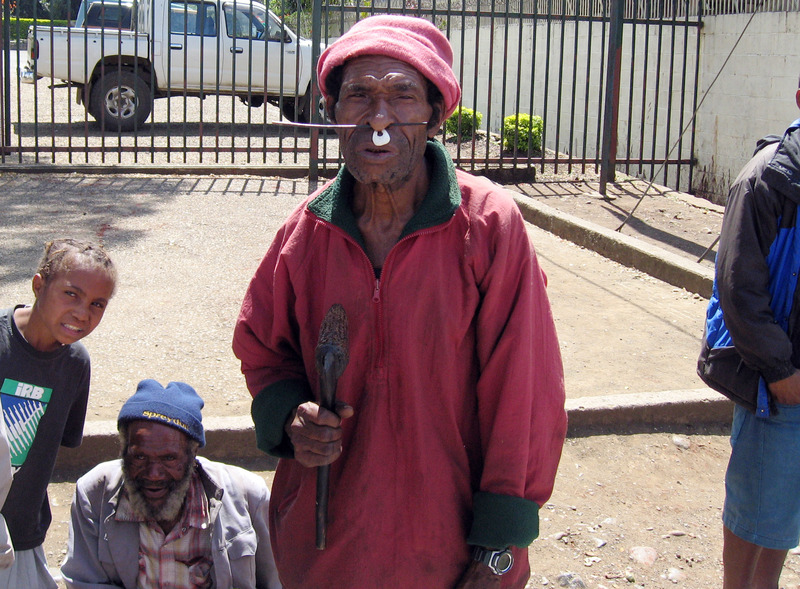 Randy is my brother, and was one of the five of us that lived here in Goroka in 1972 and 1973. 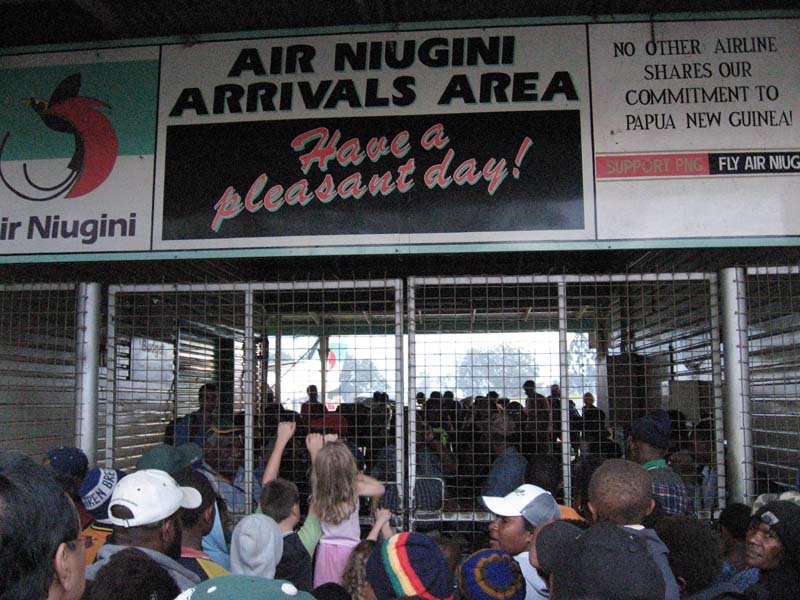 Below I am waiting for him at the arrival area at the Goroka Airport. A smiling Ramey Echt (married to Randy my brother) in front, Ari Echt-Wilson (their daughter) in tie dye blue, Randy Wilson in plaid and glasses following up. 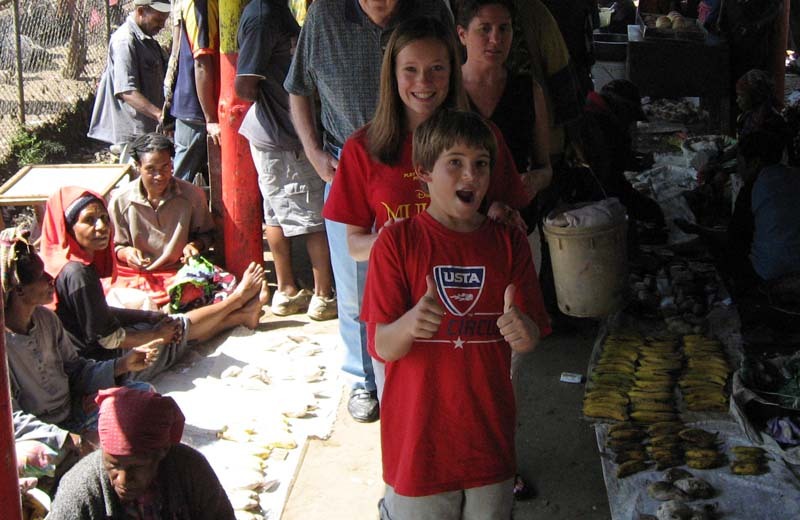 Eli Echt-Wilson (my nephew) shown below in the very lower front of the picture. Here is our whole 11 person family reunion at one table (except for me taking the picture). 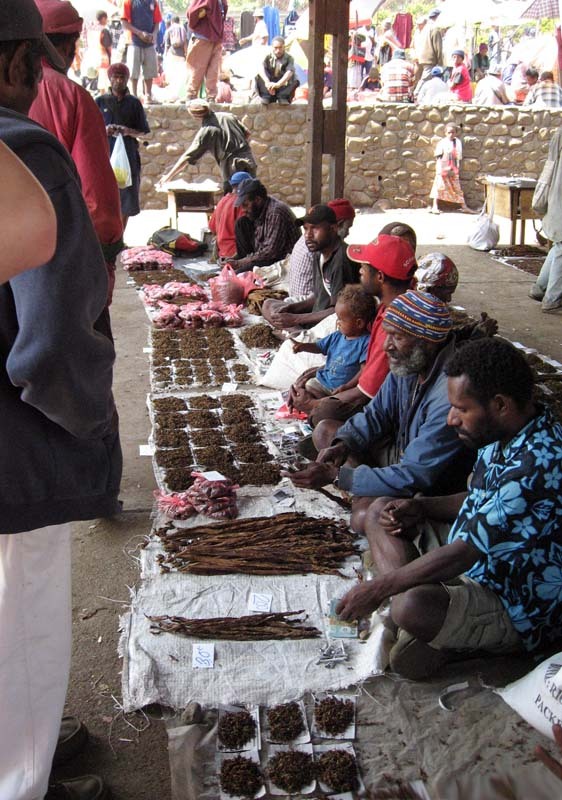 Below is the ENTIRE 11 person family reunion in Goroka, Papua New Guinea. We're in the Bird of Paradise Hotel, in the restaurant called "The Deck". I stayed in room 202, mysteriously the only room with a name in Bird of Paradise. 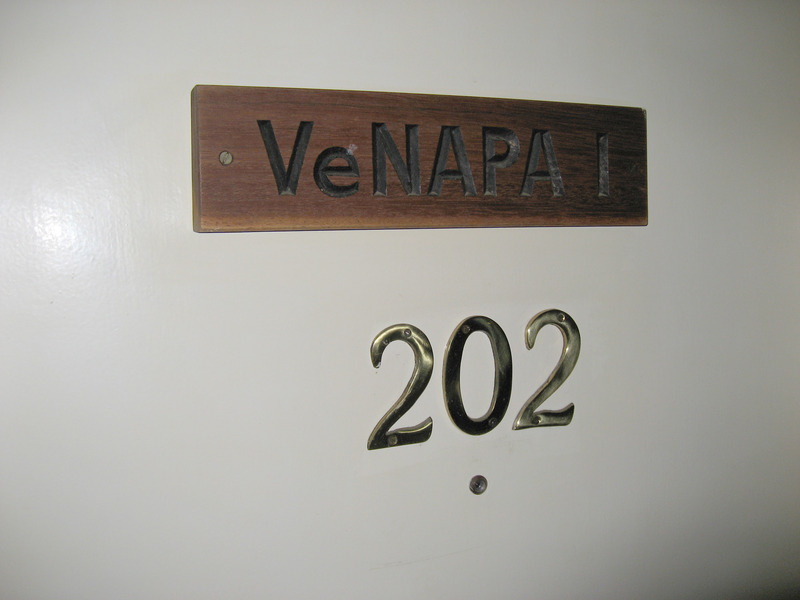 It was called "VeNAPA 1" and was a lot nicer than the other rooms we had. 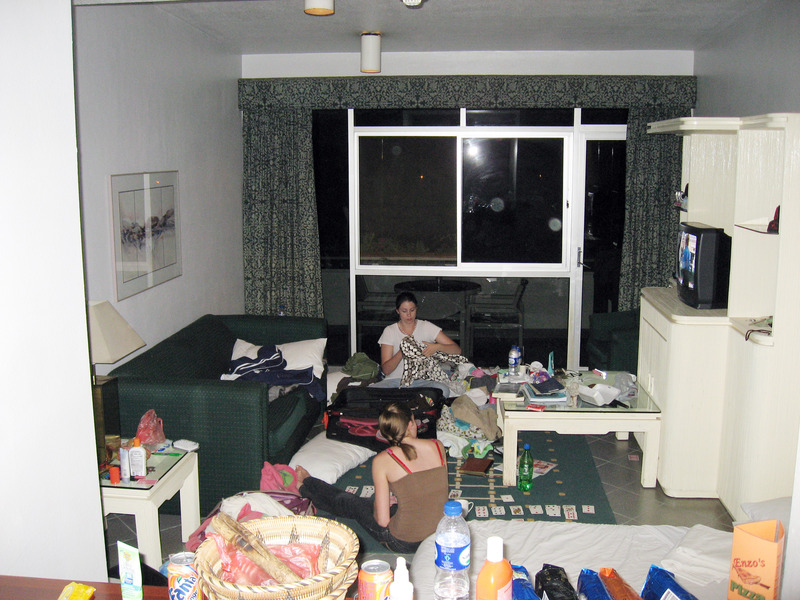 It had two full rooms, two bathrooms, a small kitchen/bar area, and a private outside balcony. If you stay at Bird of Paradise, I would recommend it. 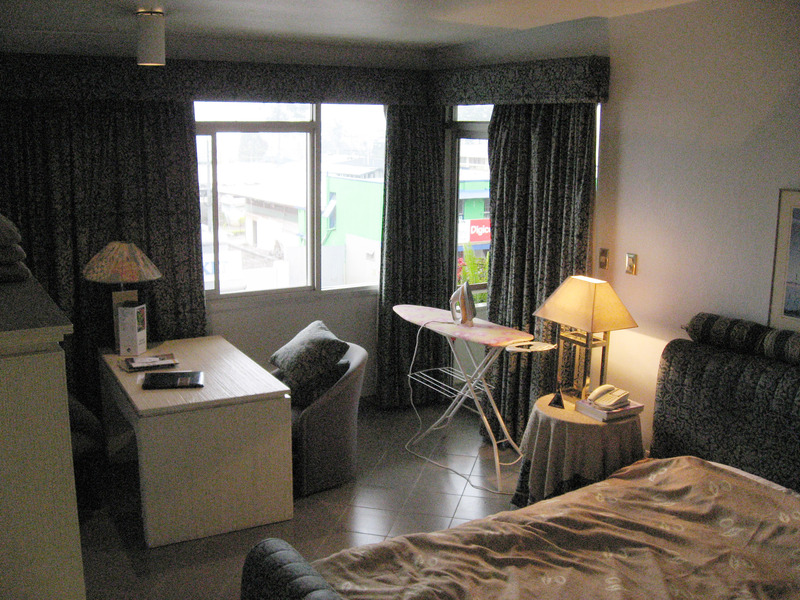 What any hotel in Papua New Guinea calls a "standard" room is below USA standards, what they call a "Deluxe" room is pretty much like a Super-8 hotel in the USA might provide you, and room 202 in the Bird of Paradise is another step up and beyond that, like a fairly nice, high end Best Western type hotel might have in a larger city in the USA. This is the view from room 202's private balcony of the street in front of the Bird of Paradise hotel. 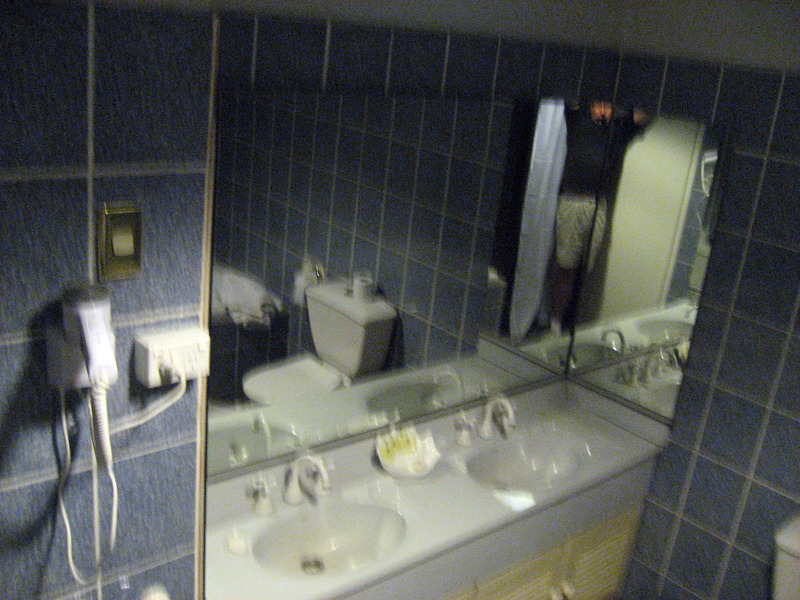 It doesn't look all that nice, but the hotel is a VERY SAFE oasis with security guards posted 24 hours a day at all entrances, and everything inside the hotel is clean and nice and polite. 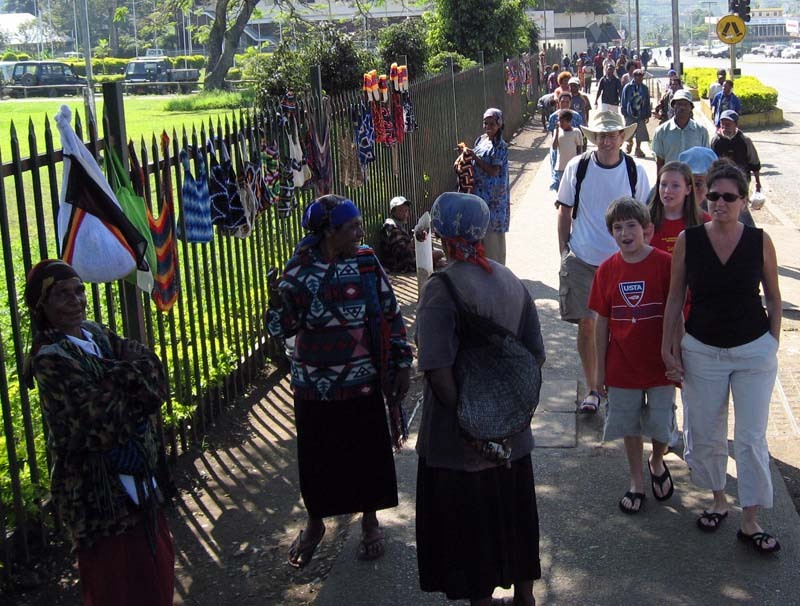 During the day I felt the outside street was fairly safe and the locals were friendly, but at night it felt a little more dodgy and I wouldn't walk around at night, ESPECIALLY alone. Ari at 7am in the morning. Notice the iPod ear buds in her ears, and the iPod on the floor STILL PLAYING. All 4 grandchildren slept with their iPods in their ears, they say they do it at home also (sometimes with external speakers). The world has changed in the last 5 years. 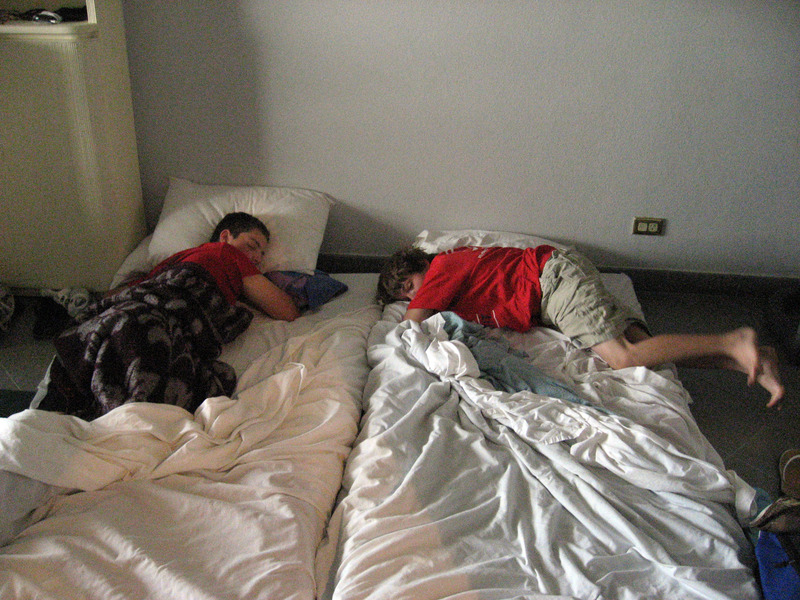 The following morning I tried to catch the kids asleep again, and Ari was one step ahead of me. 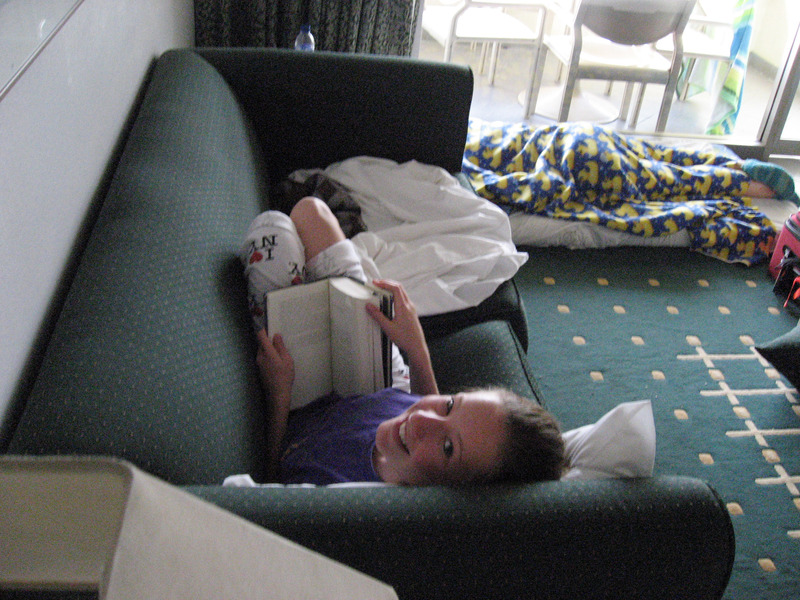 Here she is reading her book at 7am. The other kids are still asleep. 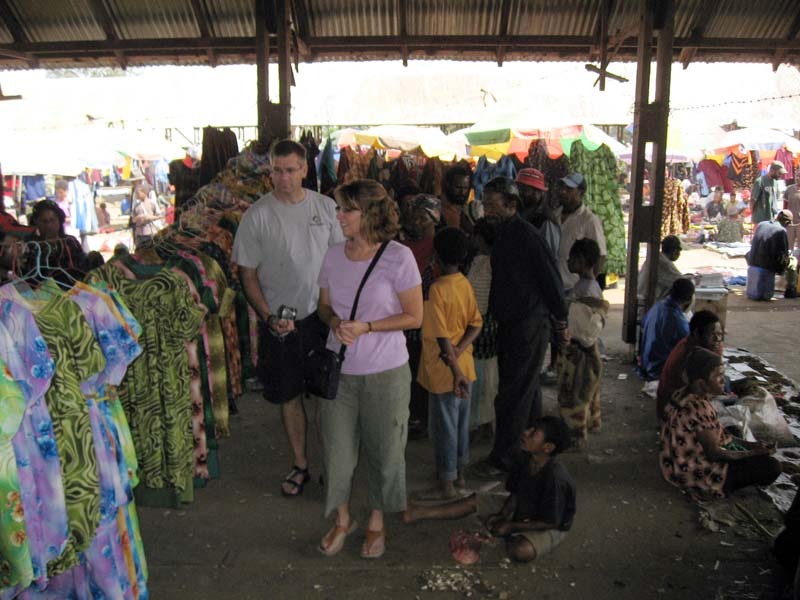 The morning of Sunday, July 27th, the Hoffmann family went off to church in the morning and the Echt-Wilson family decided to catch up by visiting the Goroka market. 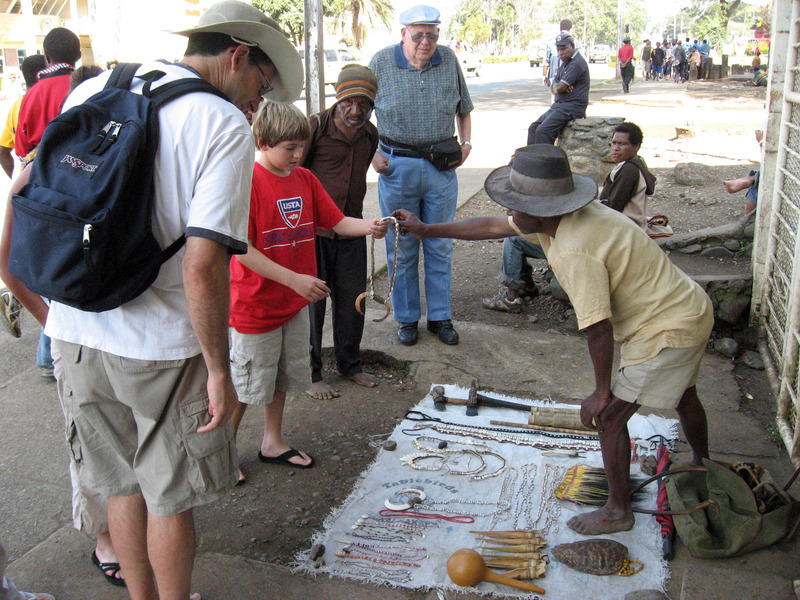 Below is Eli examining a boar tusk necklace out front of the Bird of Paradise hotel on the way to market. 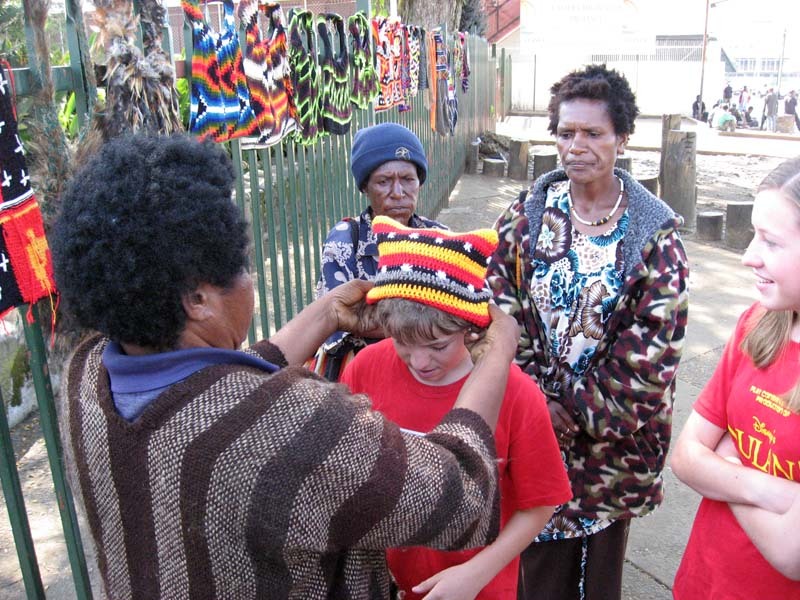 In the picture below, Eli is trying on a traditional "Papua New Guinea Highlands Hat", which is a tight knit stocking cap with a "square top" (two points). It is most commonly worn with the two points sideways (as seen below), but can also be worn with the two points front and back more like a US navy "garrison cap" also known as a "wedge cap". 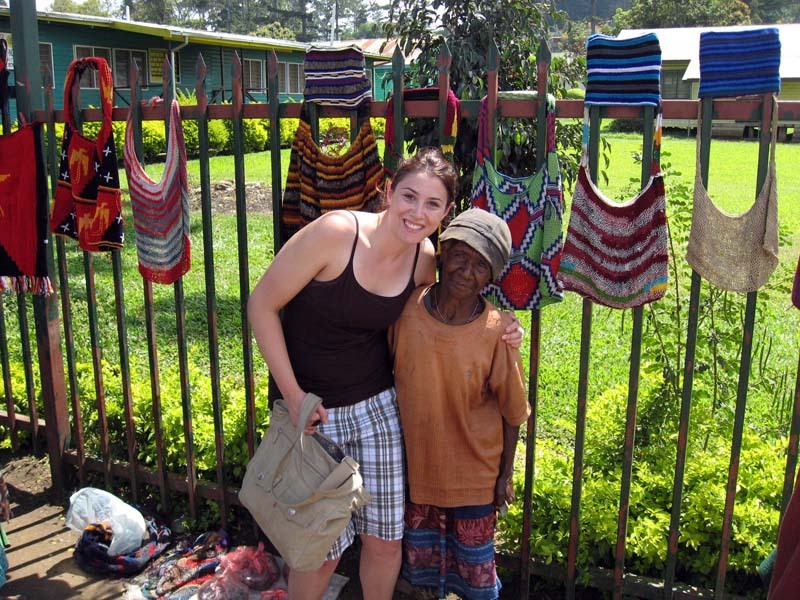 I don't know why people in the tropics would ever wear knit hats, but this was a common style among the locals. Ari looks at her brother bemused. 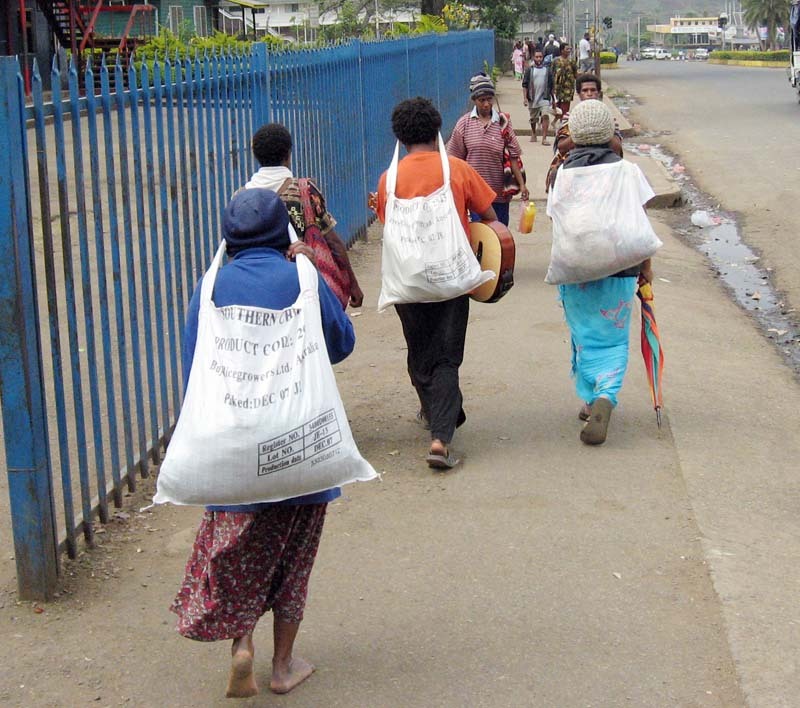 The Echt-Wilson family walking away from the hotel towards the Goroka market near where all the "mommas" sell billums. Randy (my brother) in the hat in back, Eli and Ari in red shirts, and Ramey in black top on the far right. 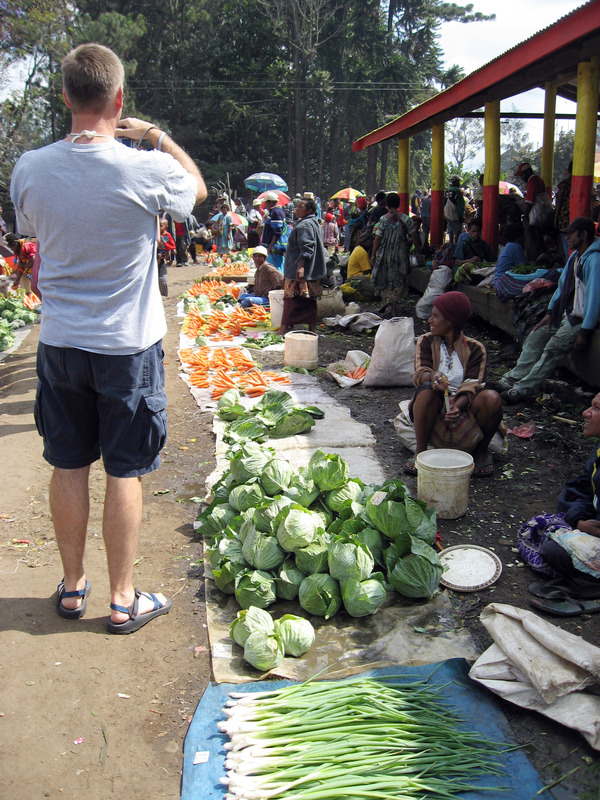 Further along in the heart of the Goroka Market, Eli mugs for the camera. 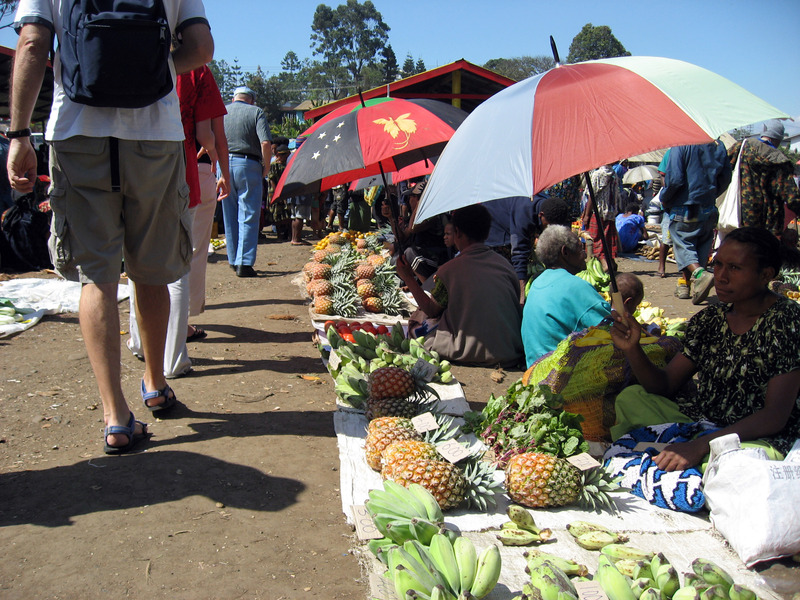 Pineapples for sale in the Goroka market. 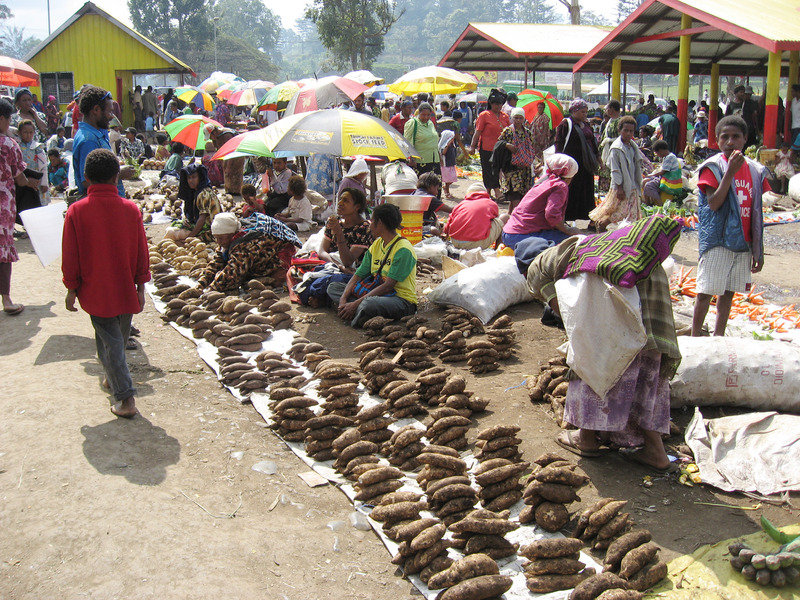 Below is a big panorama showing the mayhem market scene in Goroka. Randy appears twice because he moved during the taking of the individual pictures stitched together. When we asked some questions, the woman at the center of the picture in the blue top talking with Ramey stepped forward and spoke perfect English to explain some things. 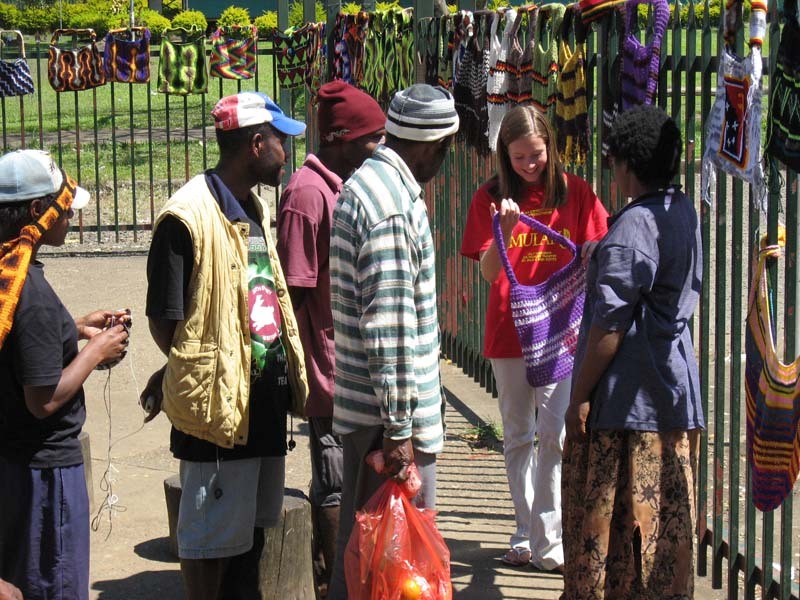 She was a school teacher that also sews some of the clothing seen below and sells it at market. 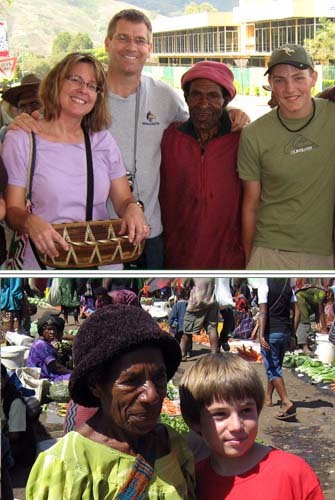 Peter is seen in the stocking cap and horizontally striped shirt on the right. Peter adopted us and showed us around the market two days in a row, we were glad to have his help (more about Peter at the very VERY bottom of this page). 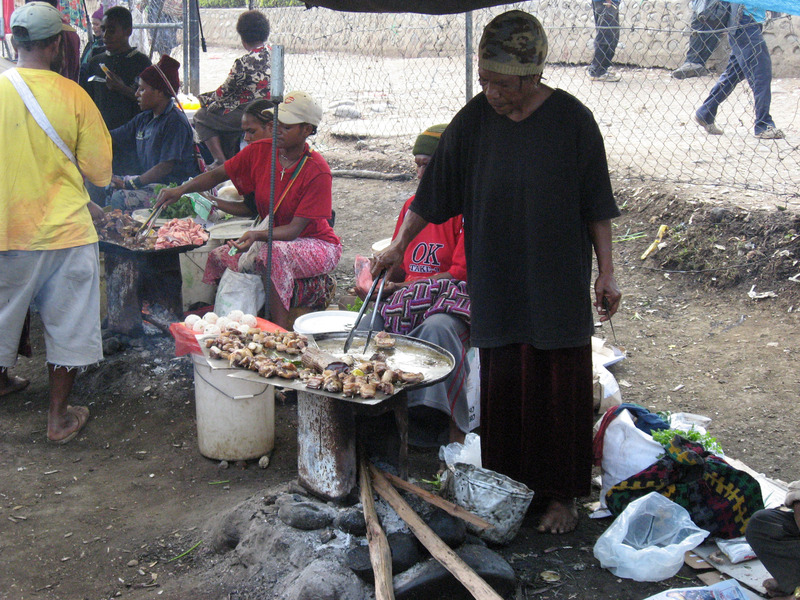 Ari in the red shirt in the "fast food court" section of the Goroka market where they cook meats and other things on wood burning hot plates. We bought something (carrots?) from this woman. 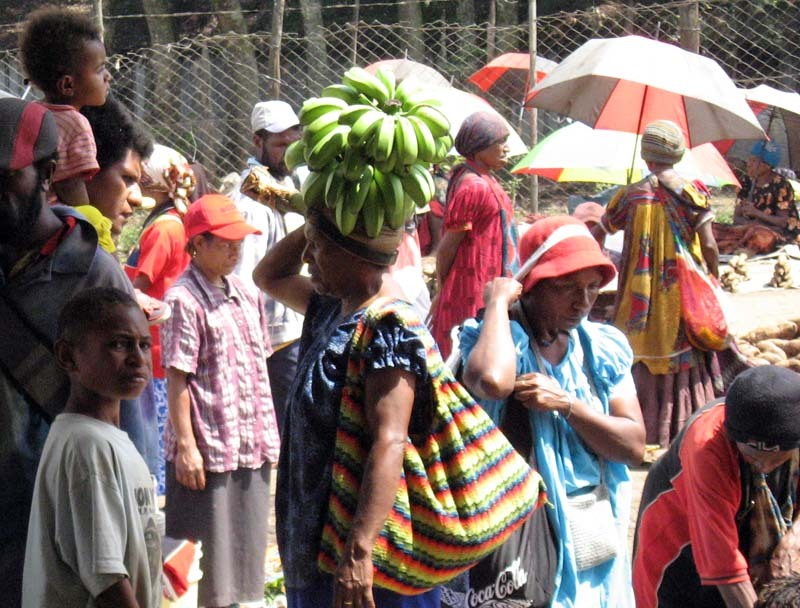 That's Eli Echt-Wilson in the Goroka market. 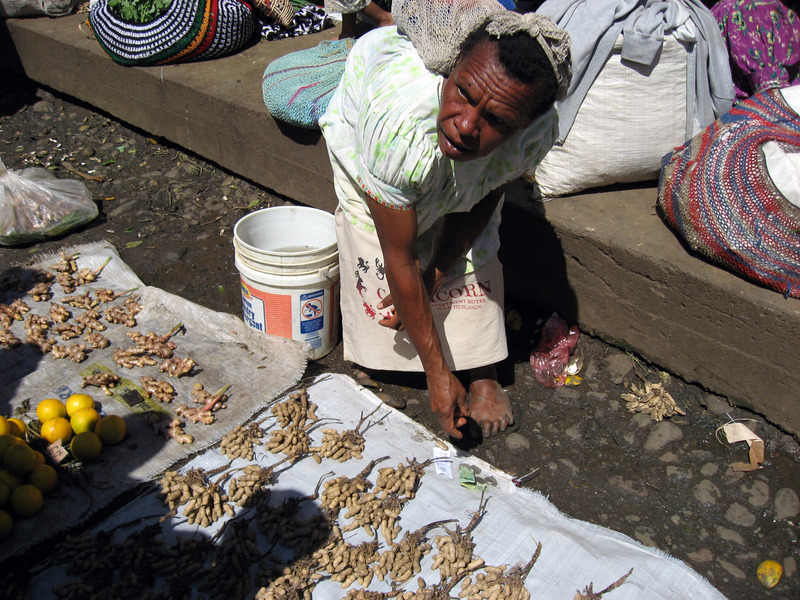 A "momma" (older "mary") with a billum on her head selling peanuts. 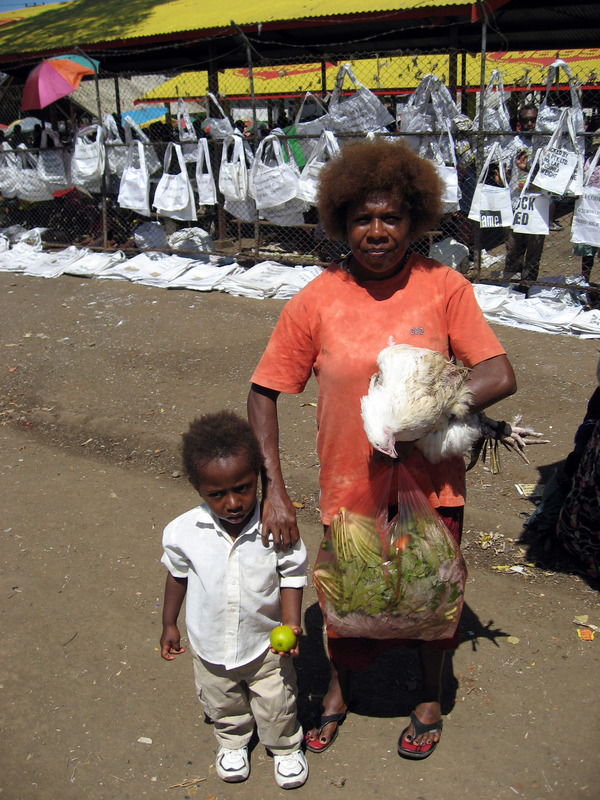 We saw several people carrying live chickens like the woman below. The chickens were healthy and calm and alive, we didn't see any dead chickens (probably lack of refrigeration means you butcher them immediately before eating). 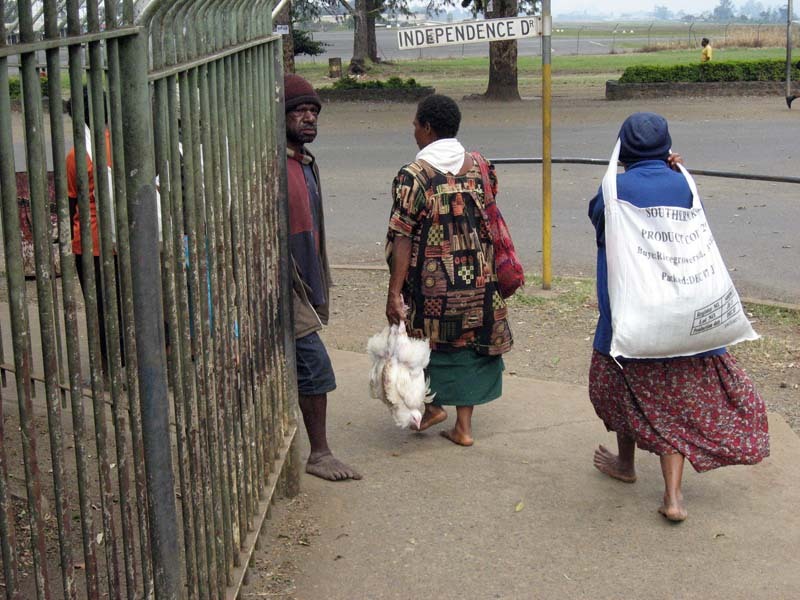 The woman just turning the corner is holding TWO LIVE chickens face down by their feet. I can't believe the chickens put up with this, but they were pretty calm. We walked behind her for 15 minutes and the chickens just hung out calmly upside down clucking sometimes. This is a good picture showing how women commonly carry billums against their foreheads with ENORMOUS loads. The bigger the load, the more likely it goes on their foreheads. A lifetime of carrying loads must give them amazing neck muscles. 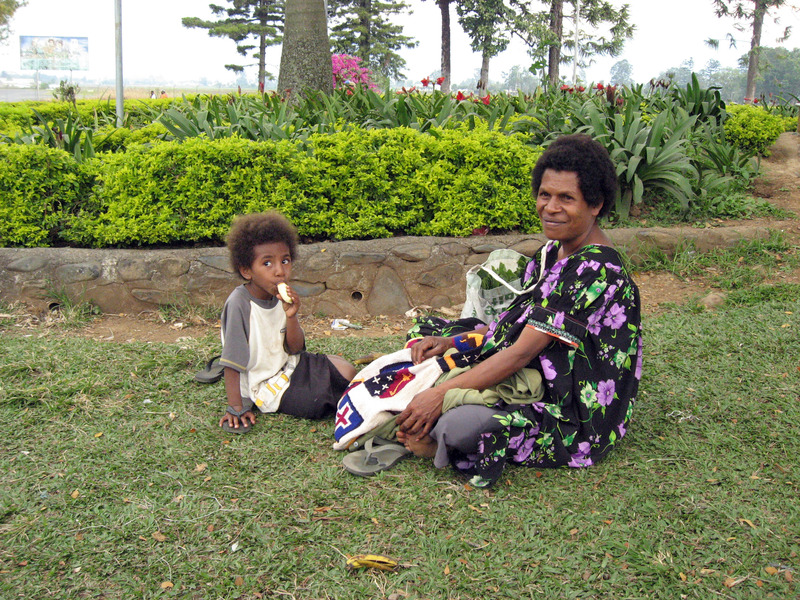 A cute local kid (the correct term is "national" for the locals of Papua New Guinea) eating a banana. 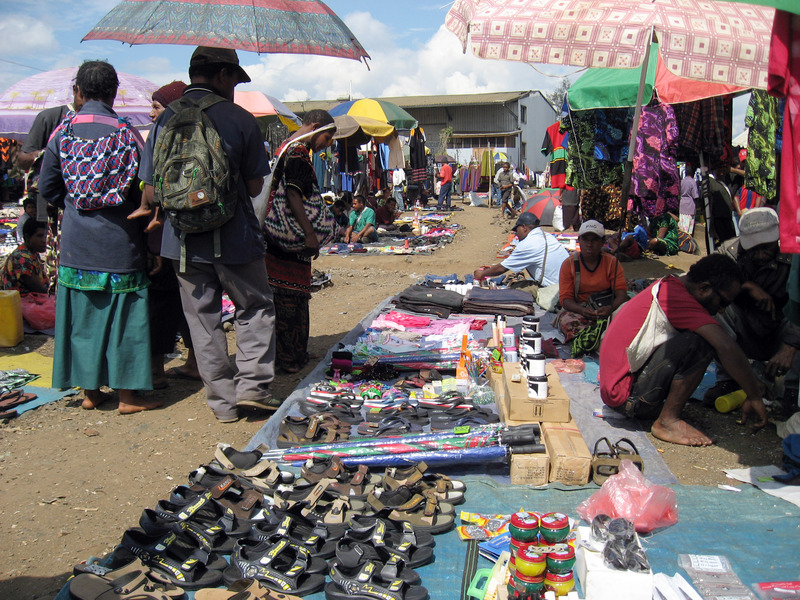 Immediately in front of the Goroka market are busses that for a small fee and a 5 hour ride will take you to Madang and other places. 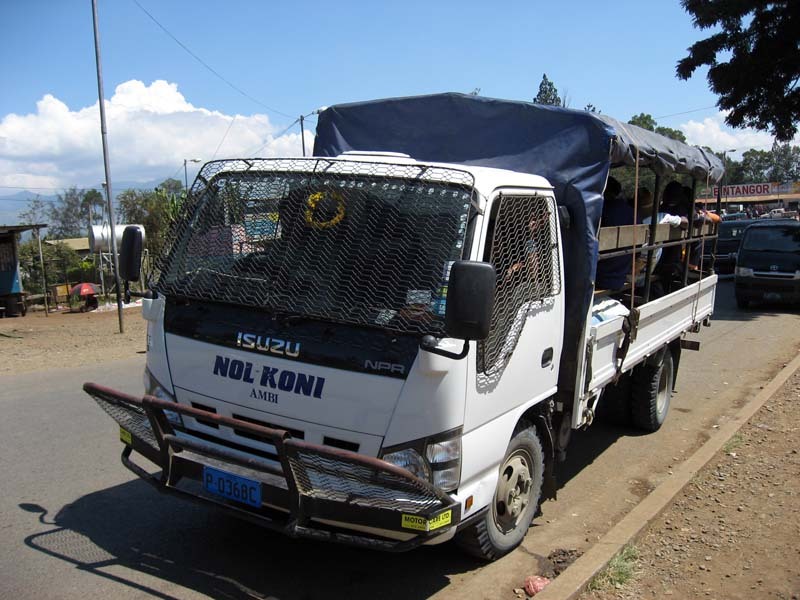 Notice the extreme windshield protection (essentially a tight chain link fence) welded onto this industrial truck made for navigating Papua New Guinea highland roads. Here is Ari picking out a billum for herself. Peter looks on from the left. Same location, zoomed back a little. 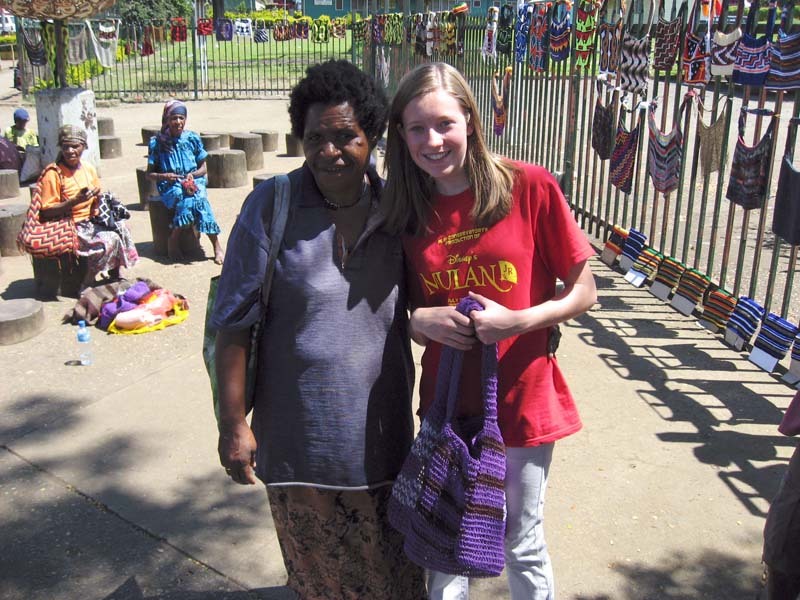 Ari chose to buy her billum from this lady. Billum, seller, and Ari in the picture below. Randy asked the woman to show a few stitches of making her current billum. Click the "Play Movie" button below to watch a short 2 minute YouTube video of two woman making two different types of a billum (a traditional bag). For WINDOWS ONLY Click Here for a MUCH HIGHER QUALITY Windows Media format movie. Below is another woman ("mary" or "momma") making a billum. And in the midst of the billum making trade, a woman quietly checks her text messages on her cell phone. A piece of modern technology in a 3rd world country. 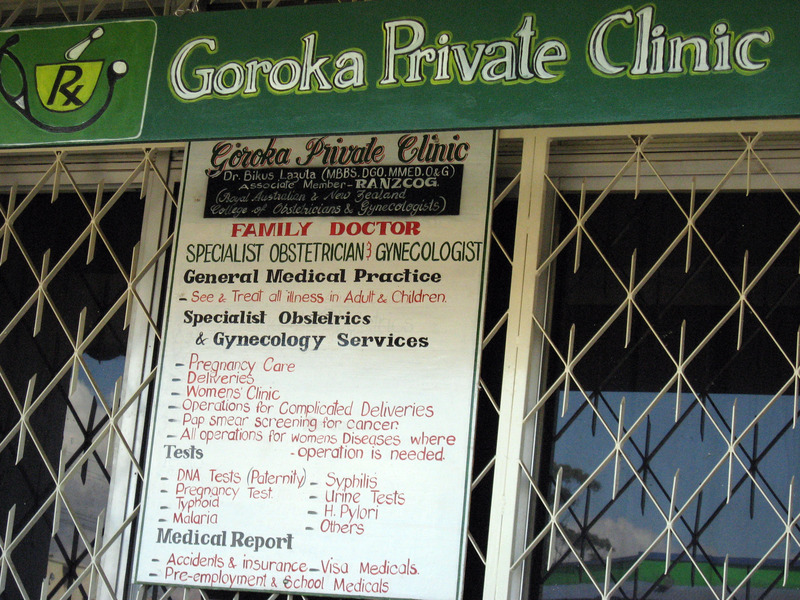 Right near the Bird of Paradise is the "Goroka Private Clinic". It says Dr. Bikus Lazula is a member of RANZCOG (Royal Austalian & New Zealand College of Obstetricians & Gynecologists). They offer generalized treatment, specifically mentioning pregnancy care, deliveries, pap smear screening for cancer, and surgical operations. 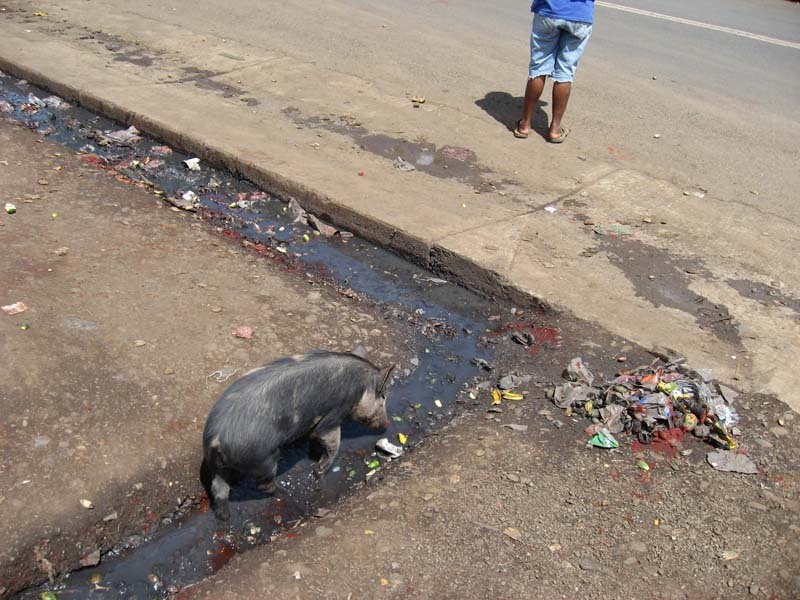 They offer tests for various things such as malaria, pregnancy, typhoid, syphilis, etc. 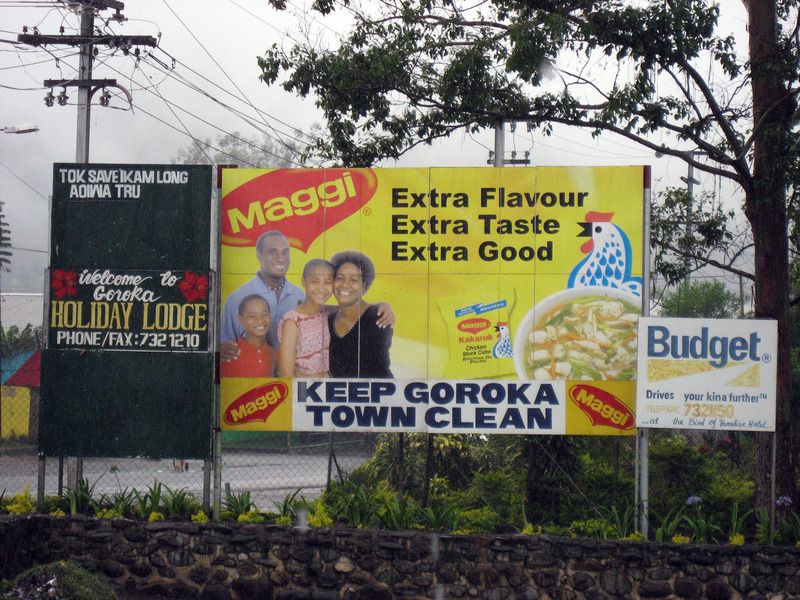 I thought it was interesting all the billboards advertising multinational brands and modern products found in Goroka, so here are a few selections. 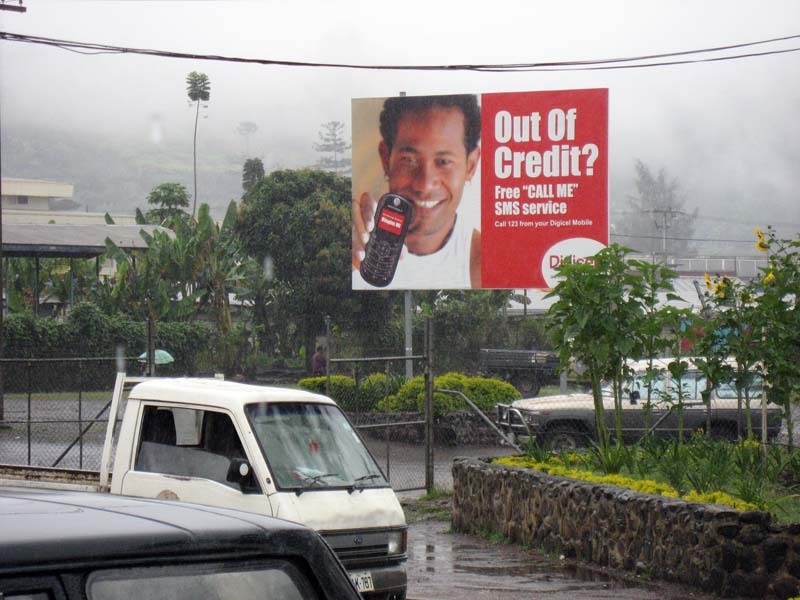 Below shows a billboard in Papua New Guinea displaying English (the most common) plus also some Tok Pisin. Ads for Maggi freeze dried soup, plus Budget rental cars, and hotels. 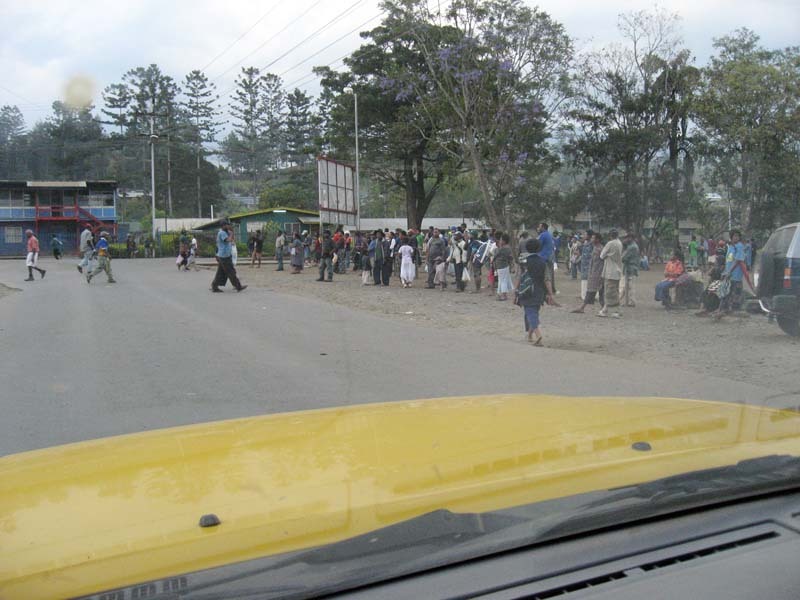 Cell phones seemed to be big and popular in Goroka, although MOST people did not have them yet we saw a few around. 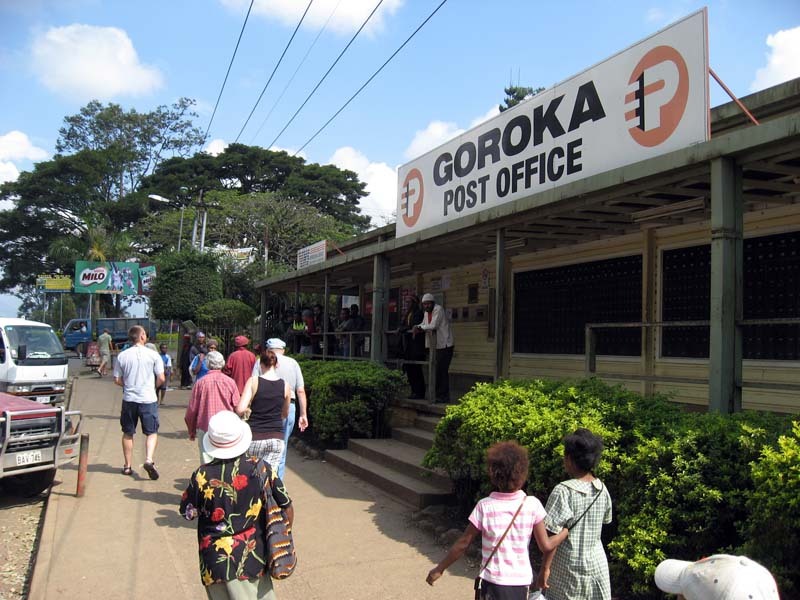 Below is a Digicel advertisement for an SMS service in Goroka. More Digicel advertisements in Goroka, this one seen in the airport on a wall. Notice it speaks Tok Pisin (the local national language). 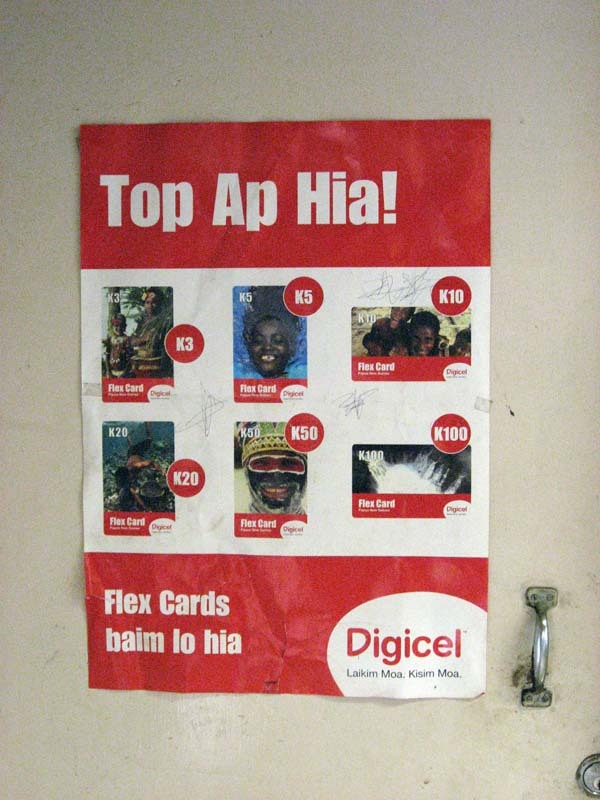 It says "Top Ap Hia! Flex Cards to baim lo hia". 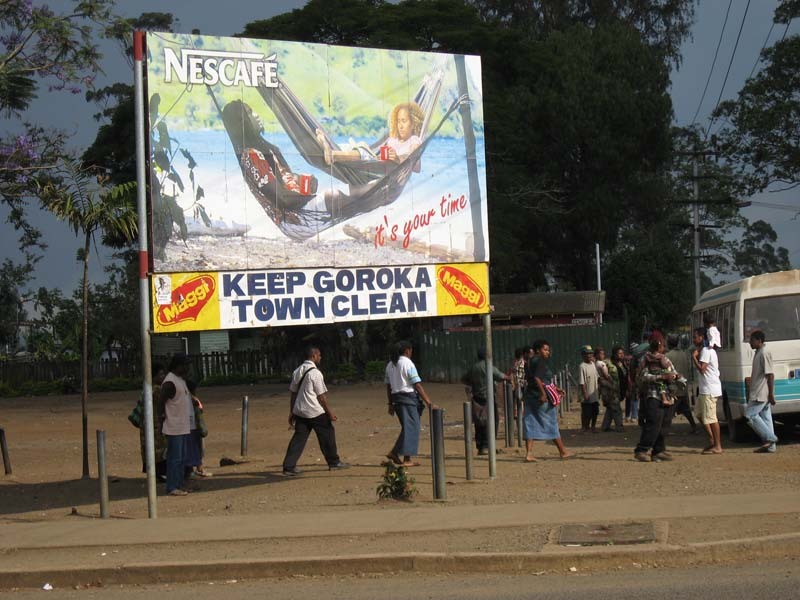 There were a lot of Nescafe billboards around, the one below is an example. 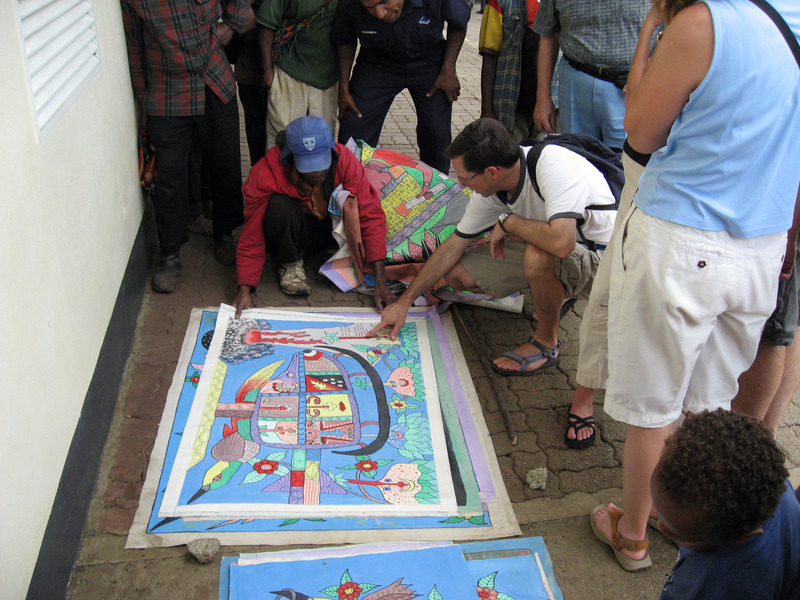 A local artist was doing political type paintings on canvas in a traditional Papua New Guinea story type. Below our family is looking at the various "political cartoons". Below is an example of one of the political paintings. It shows "Hillary Clinton" vs. "Mr Obama" in a race for the USA presidency. 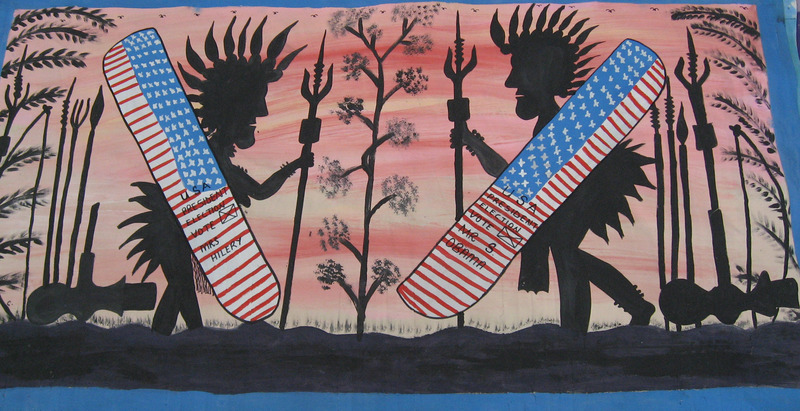 It is shown in a traditional Papua New Guinea style where the two contestants are drawn as warriors facing off. Below is the Hoffmann family posing with Peter at the end of the day. The explanation behind Peter is that he was selling things outside the Bird of Paradise hotel in Goroka, and when we didn't buy anything the first day Peter just decided to walk along with us. At first I wasn't sure why, but after a while it became clear that Peter was along to make sure we were Ok and didn't get lost and avoided any dangerous situations. 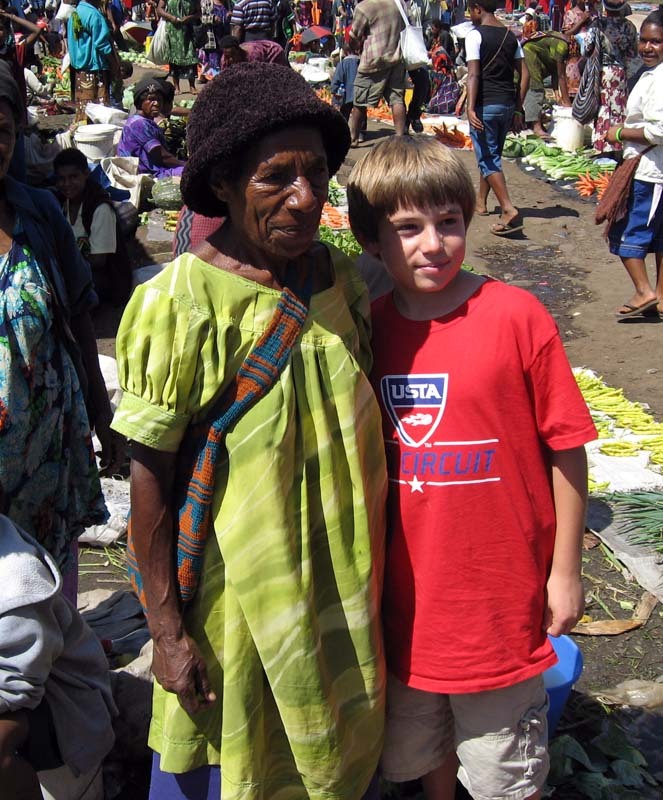 Peter could clearly see we didn't "fit in" in Goroka. :-) Peter took EXCELLENT care of us and walked all the way down to the market two days in a row with us. Our family appreciated his guidance and his friendliness, and bought a couple of his wares at the very end (including Nathanael's stone axe). 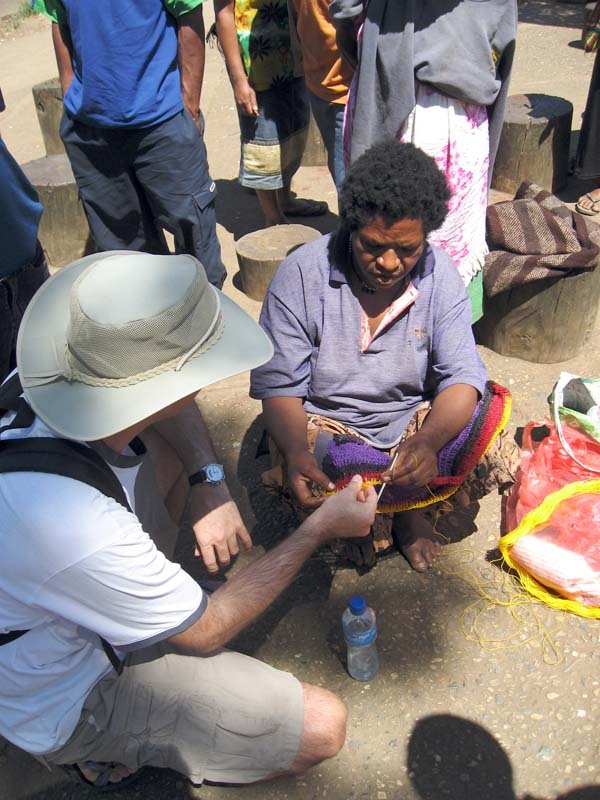 In our short trip we met several people like Peter that really went out of their way to help us out. 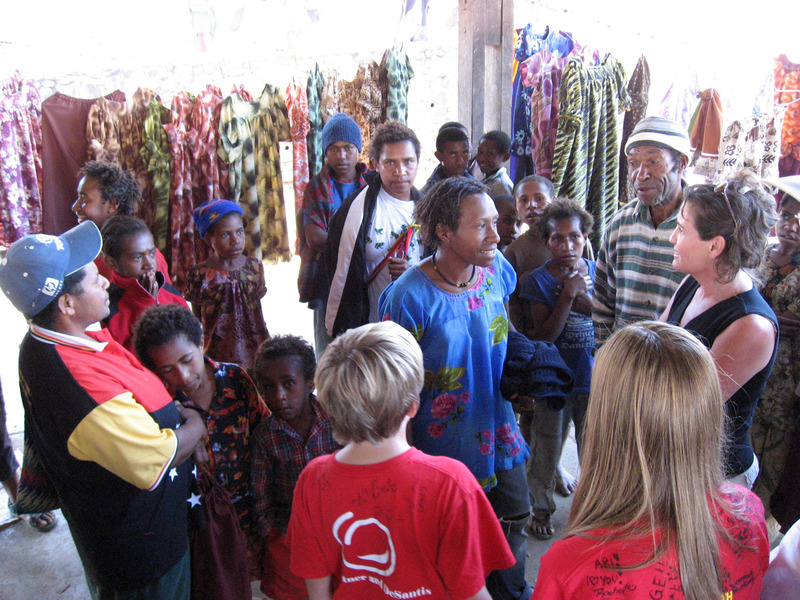 My impression is that the nationals of Papua New Guinea are actually a little SHY (not unfriendly) at first if they haven't been exposed much to foreigners, but after we had been around a couple days we would get friendly waves and hellos from people we had met just the day before. On a cautious note for travelers, there are ALSO a few hard-looking young (early 20s) men around I didn't like the look of, and sometimes Peter seemed to agree judging by how he would scoot us along out of the area. A close up of Peter looking thoughtful. 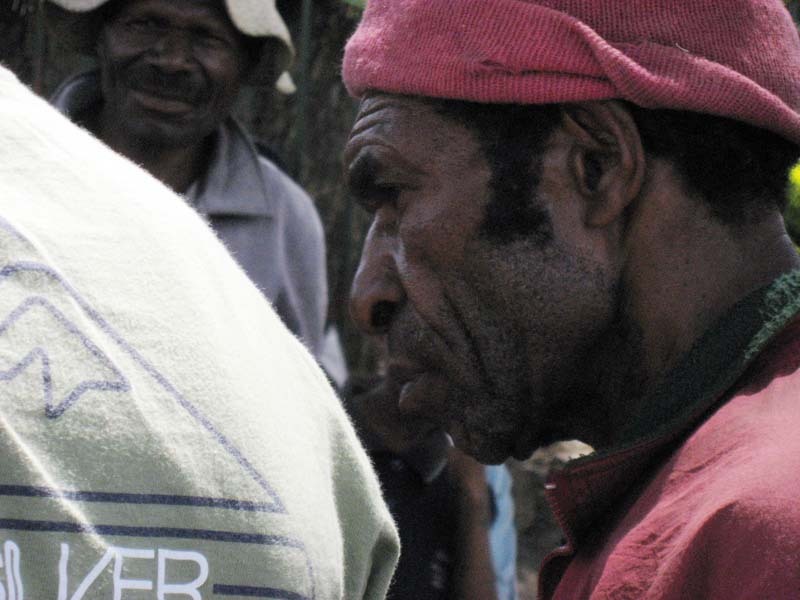 Peter spoken only the most basic English (the native tongue being Tok Pisin in Papua New Guinea), but by repeating things a few times and a little sign language we could always tell what he was saying. I always felt better with Peter around. Below Peter models a traditional combination of "nose ring and stick" for us while holding his stone axe (that Nathanael bought). Before this I didn't realize he had a hole in his nose for "dressing up". Katie bought the white nose ring from him. Click the "Play Movie" button below to watch a short 2 minute YouTube video of Peter creating fire by rubbing a thin strip of bamboo across a piece of hardwood. For WINDOWS ONLY Click Here for a MUCH HIGHER QUALITY Windows Media format movie. Peter triumphantly and with flourish lights a cigar from his fire that he made simply by rubbing a stick with a strip of bamboo. PLEASE WATCH the video above to see how easily he pulled this off! 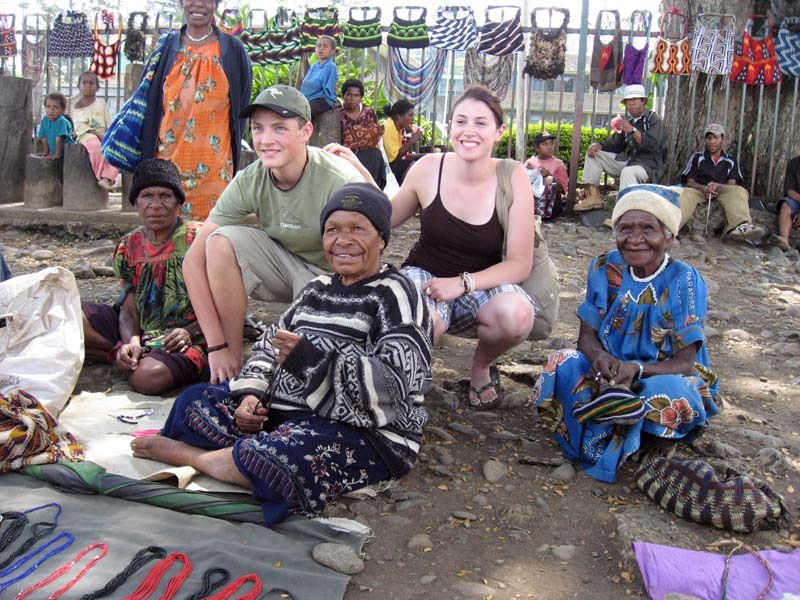 This is the end of the "Goroka Market" webpage, next is the "Goroka Tour".